It’s the final day of the Africa meets the Caribbean trade mission with a full day ahead beginning with the Transport Commissioner at the Ministry of Transport, followed by the Trinidad & Tobago Manufacturers’ Association, then United Kingdom Trade and Investment (UKTI) and lastly InvesTT. Mr Rueben Cato, Transport Commissioner met with trade mission team: Mr Bola Akindele Group Managing Director, Courteville Business Solutions PLC, Mr Femi Niyi, Executive Director (Projects , Strategy and Research, Courteville Business Solutions PLC, Mr Wale Sonaike, Deputy Managing Director (AutoReg Franchise), Mr Wole Oyewo, Courteville’s Communications consultant, Mr Denis St Bernard Director of Priority First UK / CENUK, Mr Del Atah, Managing Director Zeraxis, Mr Clyde Baker, Chairman Priority Group International and director CENUK: and the CaribDirect.com team. 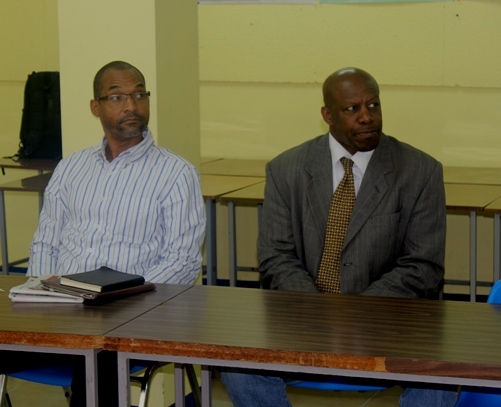 Also representing the ministry were Ms Susan Alsaran, System Analyst; Mr Nimrod Thomas, Assistant Transport Commissioner and Mr J Supersad, Motor Vehicle Inspector II. Following the usual introductions and an overview by Mr Akindele, the meeting commenced with a comprehensive PowerPoint presentation on the services of Courteville Business Solutions PLC by Mr Wale Sonaike, Deputy Managing Director (AutoReg Franchise). Mr Sonaike emphasised the competence of the company by referencing their work in Nigeria and Sierra Leone as data management specialists and the satisfaction of their clients so far. He took the opportunity to show how very useful and practical the application of the company’s flagship product, AutoReg is, the side of the business he has a deep passion for. Wale’s presentation was complemented by Mr Femi Niyi, Executive Director (Projects , Strategy and Research), Courteville Business Solutions PLC, who took time to set out the geographical perspective of the company’s present operations and scope for expansion, in Nigeria. He also touched on the sophisticated nature of the software in terms of security, allaying fears of potential breaches and hacking. 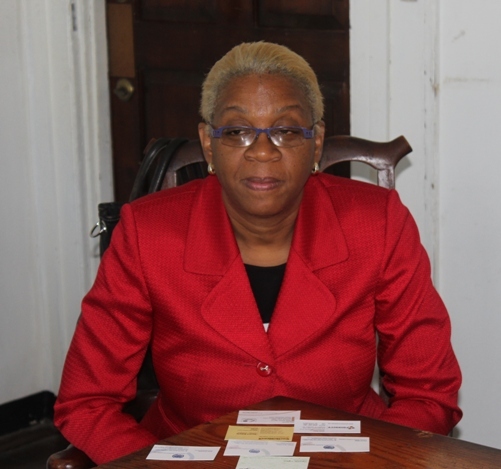 Commissioner Cato though impressed, revealed the ministry was in possession of a similar platform provided by the government of Nova Scotia. He affirmed, the system to be in it’s second phase of implementation and is working in accordance with its service mandate. Mr Cato however mentioned that the system provided by Nova Scotia is not all encompassing but does leave opportunities that Courteville can provide specialist services. The areas mentioned are: 1. Vehicle Inspection (MOT); and 2. Number plate manufacture and supply. 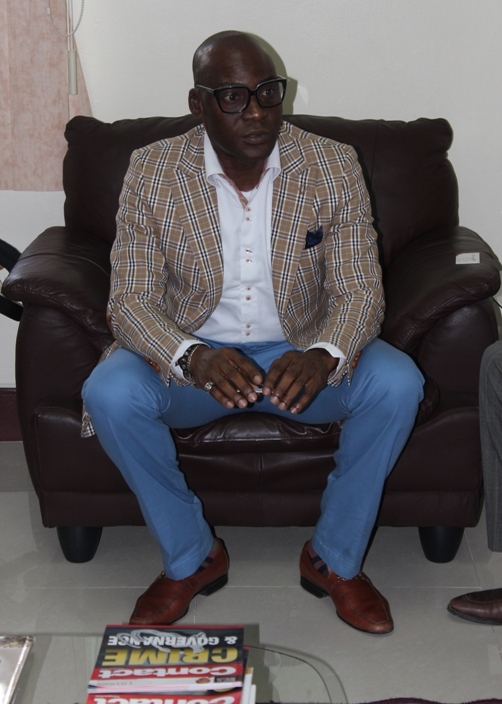 To this Mr Bola Akindele Group Managing Director, Courteville Business Solutions PLC, indicated his interest to undertake the three opportunities presented as a starting point. He hastily pointed out that the the equipment for the Vehicle Inspection is not manufactured by Courteville and is not cheap. He suggested that the governing or representative body of the 60 MOT stations around the island be approached with a view to entering into a mutually agreeable arrangement that will ensure the recovery of the cost (investment) of the 60 machines, over time. 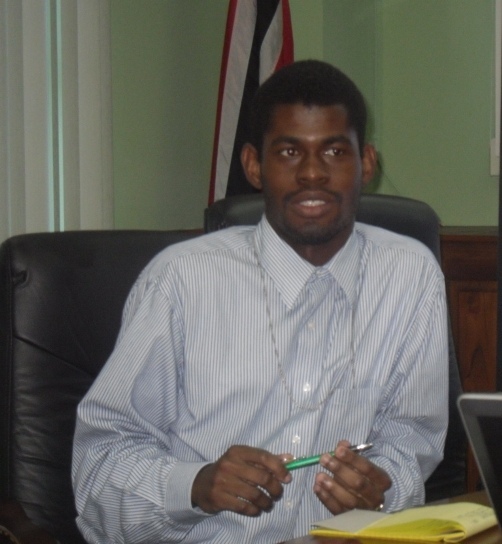 The Transport Commissioner invited Courteville to provide a formal proposal for the ministry to consider, at the earliest opportunity. Ms Renee Penco, Advisor Business and Trade Policy welcomed a fraction of the trade mission which consisted of Mr Wale Sonaike, Deputy Managing Director (AutoReg Franchise), Mrs Tokunbo Olamiju Ajilore- Chiedu, CEO Compass Consulting, Mr Del Atah, Managing Director Zeraxis, Mr Clyde Baker, Chairman Priority Group International and director CENUK: and the CaribDirect.com team. 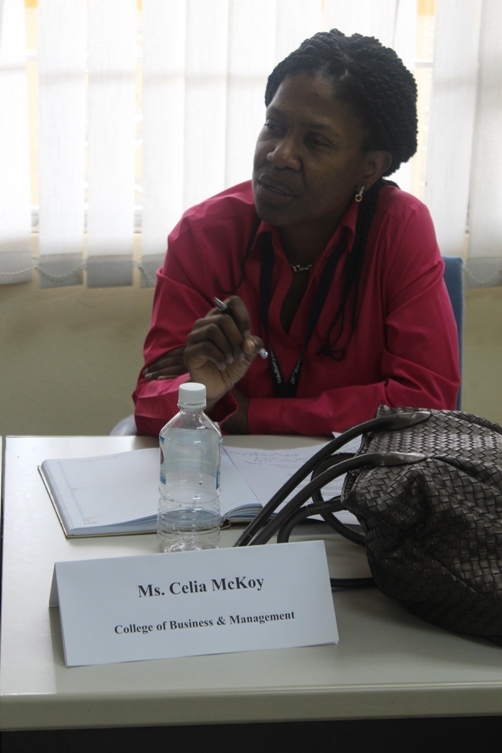 Ms Sian Hoadley, TIC Sales Coordinator and Mr Christian George, Trade Research Assistant were also in attendance. Mr Clyde Baker, Chairman Priority Group International led the introductions by spelling out the profile and scope of Priority Group International and its role in relation to the trade mission. CEO Compass Consulting Mrs Tokunbo Chiedu gave a concise account of the company’s accomplishments and work with UKTI and other public and private Nigerian and UK companies. Giving an outline of the critical role of Information Technology to business in general and the trade mission in particular was Mr Del Atah, Managing Director Zeraxis. Mr Wale Sonaike, Deputy Managing Director (AutoReg Franchise), painted the backdrop of the Nigerian economy and the fact that Nigeria’s market is ideal for investment given its size (162 million population- 20 million in its smallest state Lagos) and GDP growth at a rate of over 7% per annum. He provided a summary of the many services and areas of particular specialisation, data management and administration and stressed that as professional data managers they can provide bespoke systems to solve most challenges associated with the management of complicated systems of data. Wale invited the Association to accompany the upcoming trade mission to Nigeria later in the year for the benefit of Trinidad and Tobago companies to benefit. He recognised Trinidad and Tobago’s comparative advantage in many non-oil areas and suggested trade links be established so Nigerian businesses could learn from those success stories and the technology that makes them work. Ms Penco notified the gathering that the Trinidad & Tobago Manufacturers’ Association (TTMA) is essentially the voice or mouth piece of Trinidad & Tobago manufacturers and a credible conduit for the passage of information on policy directives to members. Mr George supported by confirming that the TTMA is also responsible for business advocacy, facilitation, trade and research. 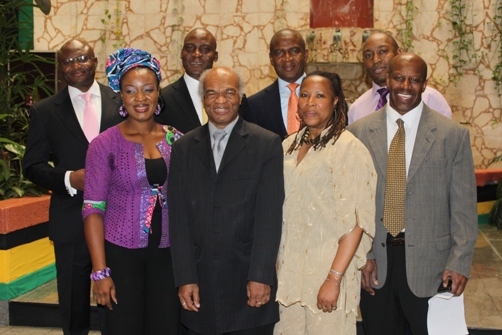 The delegation was invited to provide evidence of Grace Kennedy Foods from Jamaica and Dalgety Teas from Guyana’s entry into the Nigerian market, for presentation to the TTMA membership to serve as a positive indication that Caribbean companies have succeeded in penetrating African markets. 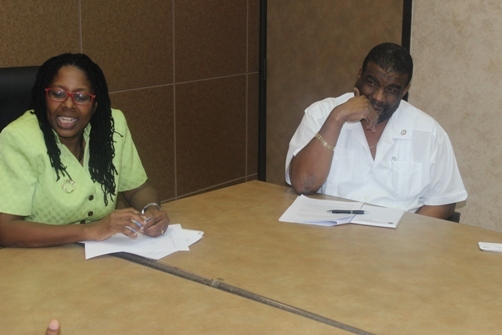 They were further advised that the best method of presenting their proposition to the membership is through attendance of the upcoming Trade & Investment Convention (TIC), June 12th to 15th at the Trinidad & Tobago Hyatt Regency. 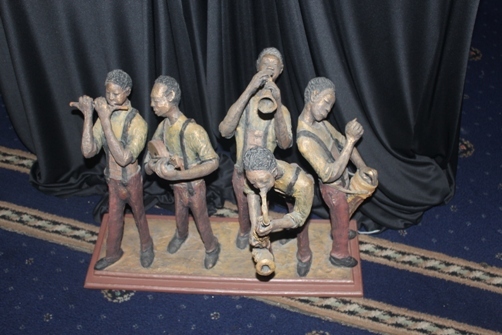 The trade mission was also urged to keep the communication links open. 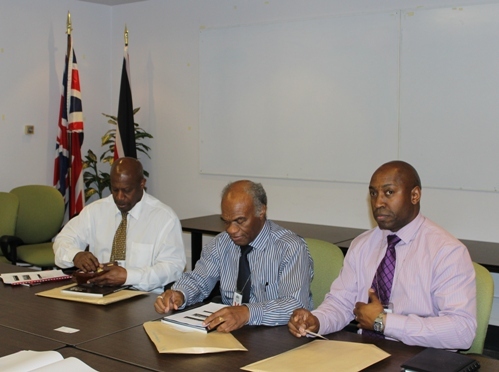 Following a quick lunch a section of the trade delegation paid a courtesy call on the UKTI’s Regional Office at the British High Commission, Port of Spain. The team including Mr denis St Bernard, director Priority Group International / CENUK, Mr Del Atah, Managing Director Zeraxis, Mr Clyde Baker, Chairman Priority Group International and director CENUK: and the CaribDirect.com team were greeted by Ms Bernadette V.K Bacchus, Trade & Investment Officer, UK Trade and Investment. As per usual the trade mission members provided a short introduction of themselves and the purpose of their respective company’s being on the mission. 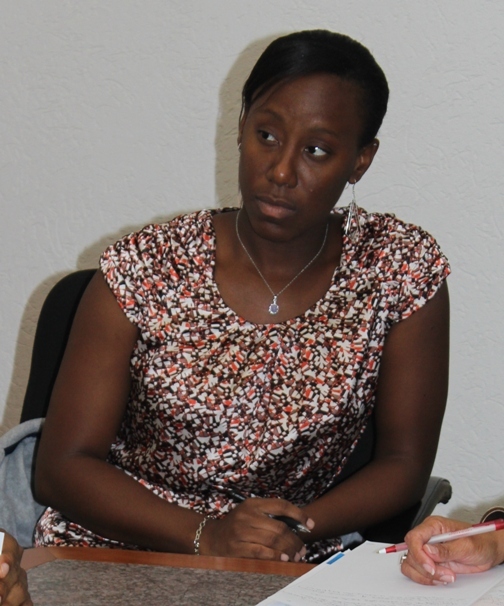 Ms Bacchus spent just under an hour briefing the delegation representatives on the role of the UKTI in the Caribbean and its links in the United Kingdom. 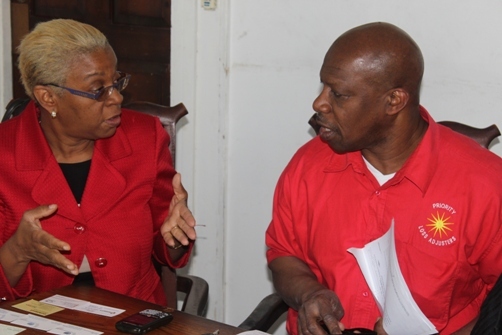 She went through several documents for the delegation’s benefit including; the Overseas Business Risk, the Trinidad & Tobago Market Briefing, and Doing business in Trinidad & Tobago. 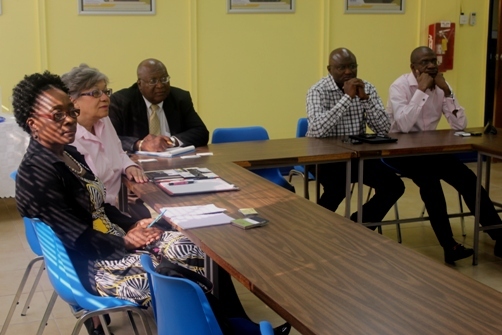 The final meeting of the day and the Africa meets the Caribbean trade mission was held at invesTT in El Socorro. 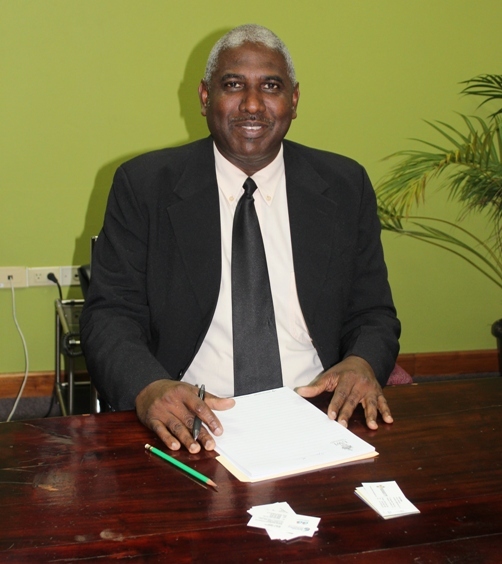 This meeting was chaired by Mr Kelvin Mahabir, President invesTT. This two hour meeting took the same format as previous and facilitated introductions of the four Nigerian officials (Mr Bola Akindele Group Managing Director, Courteville Business Solutions PLC, Mr Femi Niyi, Executive Director (Projects , Strategy and Research, Courteville Business Solutions PLC, Mr Wale Sonaike, Deputy Managing Director (AutoReg Franchise), and Mr Wole Oyewo, Courteville’s Communications consultant) and the Priority First UK contingent. 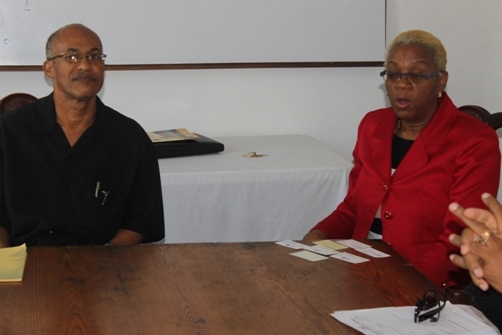 Mr Mahabir was ably assisted by Ms Heidi Noble, Manager Facilitation who arranged the meeting, Mr Shyamal Chandradatsingh, Manager Investor Sourcing and Mr Sekou Alleyne, Manager Investor Sourcing. The whole gamut of the Courteville offering was presented and discussed thereby providing valuable insights to the invesTT head who found the details of the Nigeria market particularly interesting and proffered several areas of possible collaboration. 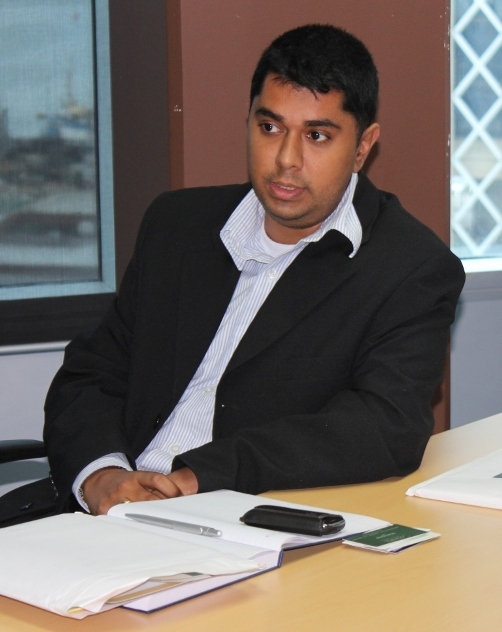 In recognising the potential for the implementation of Courteville’s sophisticated suite of data management software into Trinidad and Tobago, Mr Mahabir insisted Group Managing Director Bola Akindele through Priority Group International commit to continuing the dialogue. 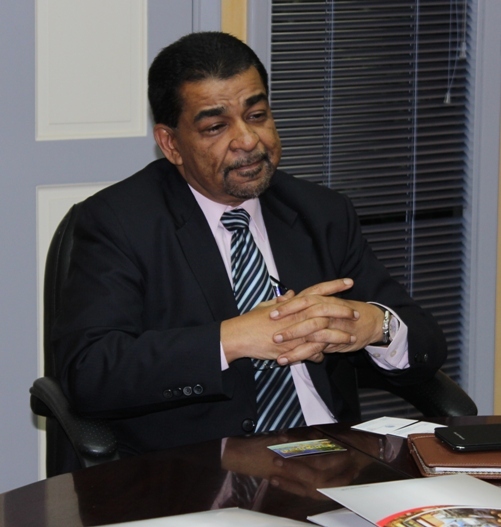 Mr Mahabir also stressed the importance of Courteville ushering in it’s products into Trinidad & Tobago via established trade and investment fora such as the Trade & Investment Convention. 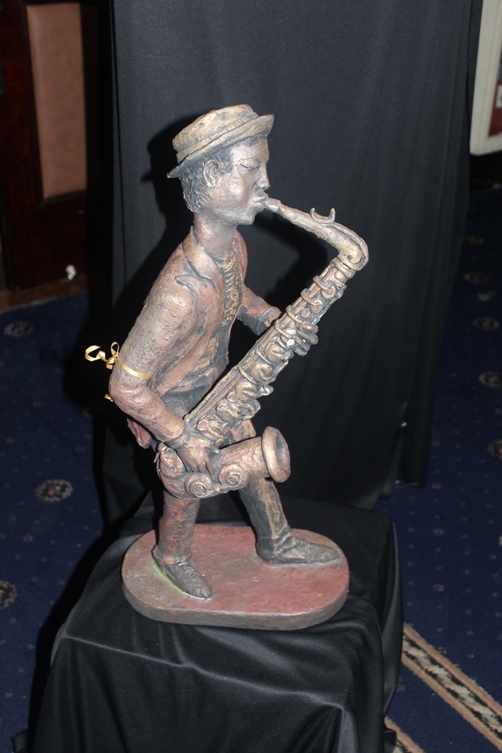 The Trinidad & Tobago and final leg of the Africa meets the Caribbean Trade Mission began promptly at 9am on Friday 25th January 2013, following the delegation having arrived and settled in to their respective hotels well past 1am that morning. Ministry officials on hand to meet the trade delegation were Director of Investment Mr Wayne Punnette, and Senior Investment Specialist Mr Videsh Maharaj. 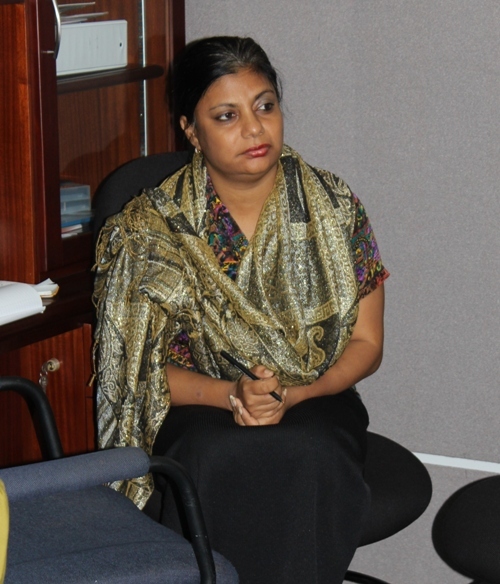 Also in attendance was InvesTT’s Senior Facilitation & Aftercare Officer, Ms. Nyala Singh. 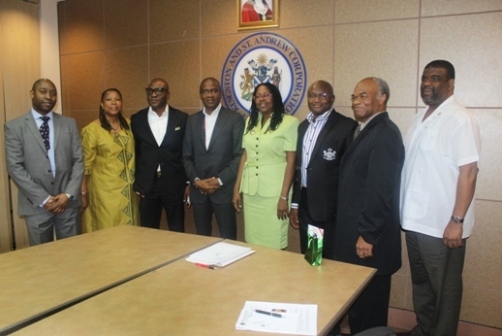 The trade mission team for Trinidad meetings comprised Mr Bola Akindele Group Managing Director, Courteville Business Solutions PLC, Mr Femi Niyi, Executive Director ( Projects , Strategy and Research, Courteville Business Solutions PLC, Mr Wale Sonaike,Deputy Managing Director ( AutoReg Franchise ), Mr Wole Oyewo, Courteville’s Communications consultant, Mr Denis St Bernard Director of Priority First UK / CENUK, Ms Tokunbo Olamiju Ajilore- Chiedu, CEO Compass Consulting, Mr Del Atah, Managing Director Zeraxis, Mr Clyde Baker, Chairman Priority Group International and director CENUK: Mr Moriba Baker, Priority Groups International local representative and the CaribDirect.com team. The customary introductions were done beginning with Mr Denis St Bernard Director of Priority First UK who spoke to the importance of the trade mission to Trinidad & Tobago from the point of view of facilitating business inflows from Africa and encouraging local companies to access global markets, particularly in Africa. 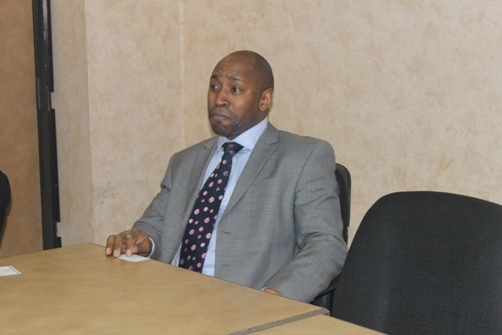 Mr Bola Akindele Group Managing Director, Courteville Business Solutions PLC followed swiftly pointing out that his meetings in Jamaica were very encouraging and from his knowledge of Trinidad & Tobago he is confident positive alliances will result at the end of the visit. 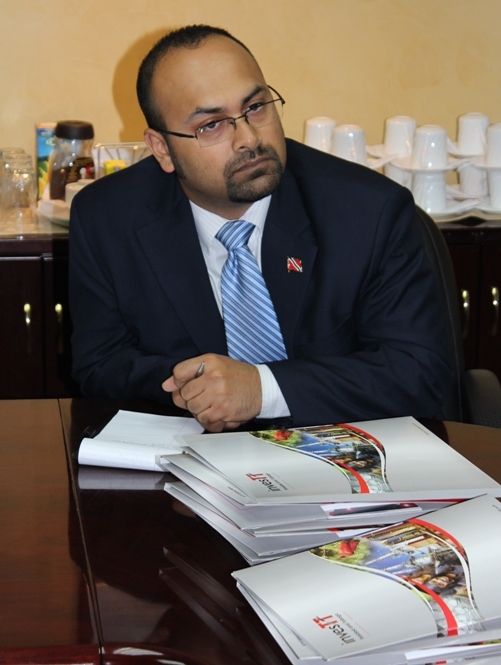 On the Information Technology side, Mr Del Atah, Managing Director of Zeraxis described his company while outlining the relevance of IT to the trade mission and by extension Trinidad & Tobago. He spoke of Zeraxis’ global experience having secured contracts all over Europe and his keen interest to enlist Trinidadian entrepreneurs and/or SME businesses to work on global accounts. Mrs Tokunbo Olamiju Ajilore-Chiedu, CEO Compass Consulting referenced her extensive experience facilitating trade between Nigeria and UK via a strategic partnership with UKTI. 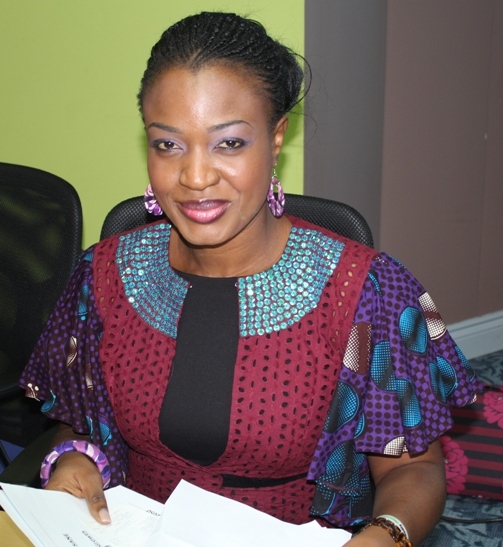 Being in the investment and trade promotion space she has been able to create a platform called Enterprise Exhibition, an event that brings businesses from many continents together in Lagos Nigeria. Compass Consulting are proud to have facilitated Grace Kennedy Foods from Jamaica and Dalgety Teas from Guyana’s entry into the Nigerian market. CaribDirect.com’s CEO and Publisher David F. Roberts delineated the role of CaribDirect on the trade mission emphasising the importance of sensitising the Caribbean region and Diaspora to the opportunities that will open up as a result of Courteville Group’s investment in the Region facilitated by Priority Group International / CENUK. 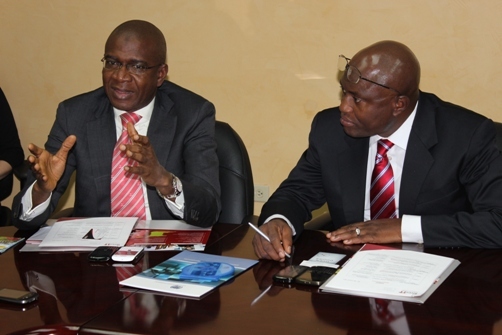 Leader of the Nigerian delegation Mr Bola Akindele followed through by shedding light on the USP of the Courteville Group which is to develop and design smart solutions targeted to both private and public sector end users ‘seriously, cheaply and fast!’ He confirmed that the Group has patented solutions all over the world and are world leaders in these solutions. Bola made the observation that, like Nigeria, Trinidad & Tobago is very strong in Oil production but may not be as proficient in other areas that Nigeria has perfected over the years, which presents an opportunity for both parties to explore. The Courteville chief then zeroed in on his company’s flagship product, the AutoReg motor vehicle documentation, administration and tax control system. Bola suggested this system to be very useful to the government of Trinidad & Tobago given it’s successes in Nigeria and Sierra Leone. 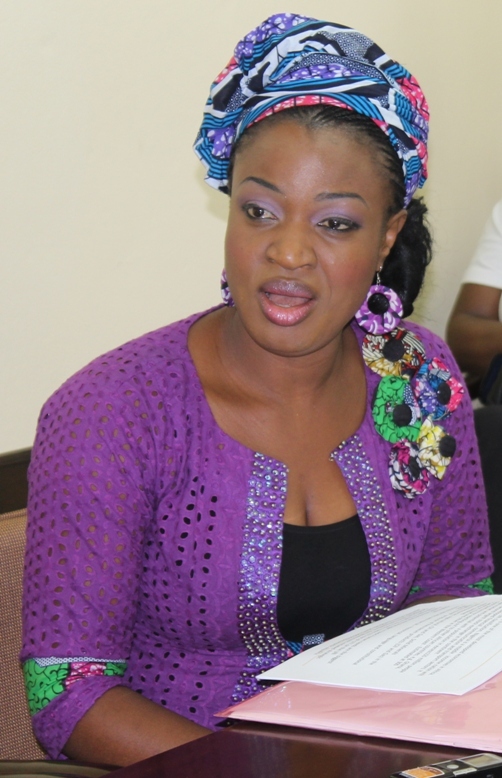 Director of Investment Mr Wayne Punnette enquired of Mrs Tokunbo Olamiju Ajilore-Chiedu, CEO Compass Consulting, whether any invitation was sent to Trinidad & Tobago companies in the past, to which she replied, ‘No’. That this visit was to reconnoiter (scout, survey) the Caribbean market to establish credible linkages from which to begin planning focused discussions for doing business. 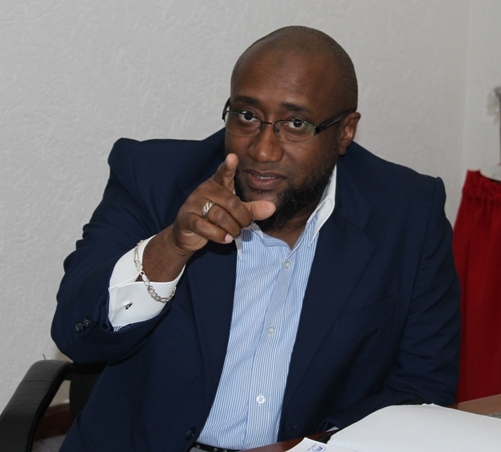 Mr Punnette suggested Courteville meet with the Ministry of Finance or Inland Revenue Department pertaining to discussions on Courteville Group’s stated competence in tax administration and control. A meeting was immediately set for the afternoon of Monday 28th January, the penultimate day of the Africa meets the Caribbean Trade Mission. Mr St Bernard seized the opportunity to gain clarification on the remit of the Aftercare Department of InvesTT. 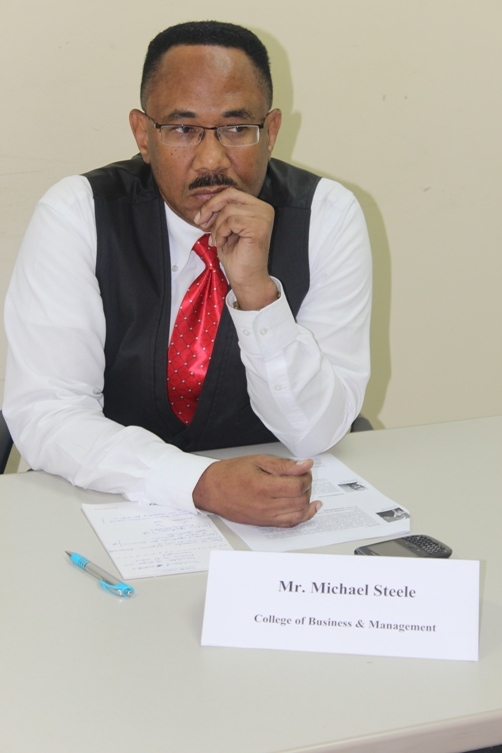 Nyala Singh explained that the department was set up to support the Facilitation department that attracts Foreign Direct Investment (FDI) into Trinidad & Tobago, whether it be providing information, organising site visits and so on. Once investors have been secured the Aftercare function begins which takes the form of a hand holding exercise geared to make business easier for the full length of time the investor is in Trinidad & Tobago to encourage expansion and reinvestment. 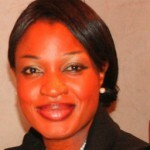 MD Bola has confirmed, pending the success of discussions in Trinidad & Tobago and all formalities being observed Courteville Group will set up business in Trinidad & Tobago.CEO Tokunbo asked what markets InvesTT targeted to which she was told North America, Canada, Europe and to a lesser extent India. The effort is also sector driven with InvesTT focusing on the following sectors: ICT, Creative Industries, Maritime, Light manufacturing, and Clean technologies. 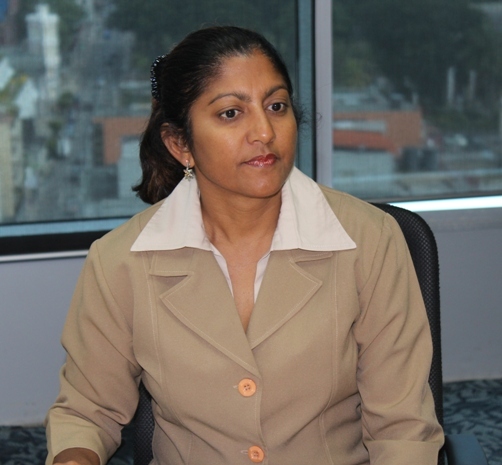 Director Punnette hastened to indicate the government’s heavy promotion of Sports tourism, aimed at encouraging foreign sports teams, clubs and individuals to come to Trinidad & Tobago to use their state-of-the-art facilities located in near perfect weather all year round. He also stressed the work done to promote the Energy sector with trade missions being sent out to Ghana, Nigeria, Tanzania and so on trying to promote energy services. 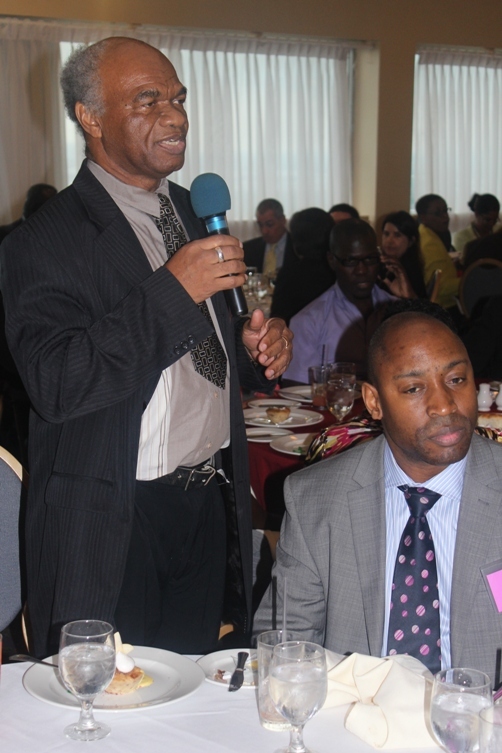 He pointed out that any energy sector across the world has Trinidadians providing specialist energy services. In closing Mr Videsh Maharaj, Senior Investment Specialist mentioned the upcoming Investment Week June 10th to 15th, which comprises the Caribbean Investment Forum and Trade and Investment Convention, aimed at featuring private and public investors including regional manufactures at the Hyatt. 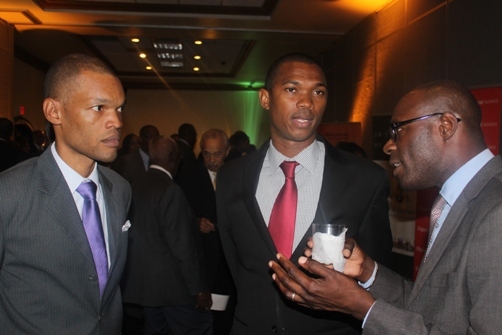 He urged the delegation to take advantage of this key business trade show by attending. 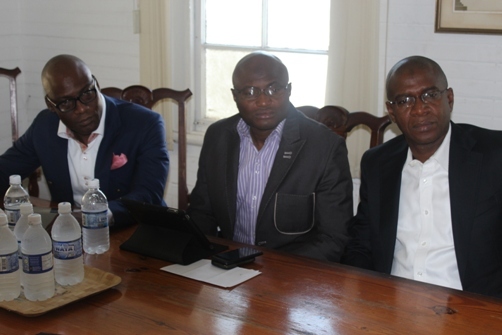 The Trade representatives pledged to continue discussions toward formalising an arrangement with Courteville Business Solutions PLC through Priority Group International. 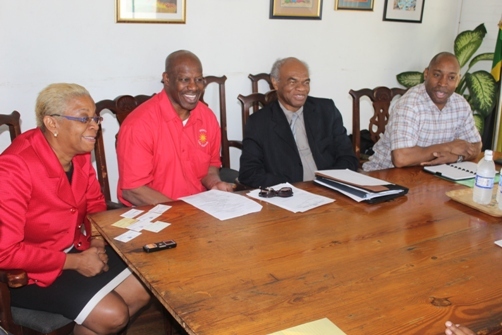 The entire delegation journeyed to the offices of the Trinidad & Tobago Chamber of Commerce at Columbus Circle, West Moorings, a short drive across Port of Spain. They were met by Trade and Business Development Manager, Mrs Camille Sears-Carter Wells, Trade and Research Economist, Ms Rianna E. Paul, Trade and Research Economist, Stacey Honore and Mr Jerome Chambers, Chief Executive Officer, Going Global Ltd. The forum was opened by Mr St Bernard who informed the Chamber officials of the purpose of the trade mission which is essentially to engender South / South trade and open up opportunities for Trinidadian companies interested in expanding to Africa. 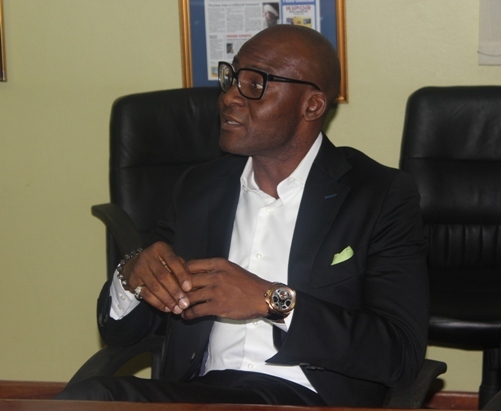 In his usual way Courteville Business Solutions’ Group Managing Director, Mr Bola Akindele enlightened the officials of the size of the African market and its propensity to continue growing. He mentioned that his company has been successful in rolling out a specialised software program that has been embraced by both private and public sector organisations in Nigeria and Sierra Leone. He opined that Courteville has the capability to design and develop bespoke programs for the management of large complicated data systems, second to none anywhere and operates on the unique basis of doing the work first with the view to being paid later. The Courteville team are professional and experienced data managers that put their reputation behind their work. Bola further stated that Courteville has been listed on the Nigeria Stock Exchange for the past 5 years and capitalised at $250 million in shareholder stock. 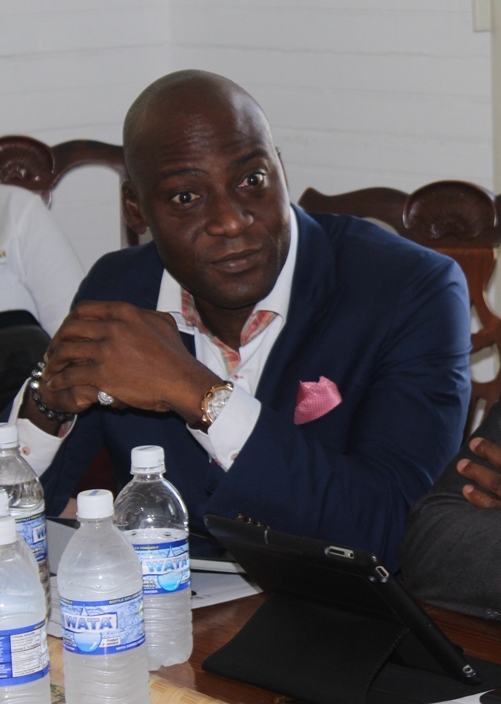 He assured the Chamber executive that all that he has said is verifiable and that they could conceivably deliver on a contract within eight weeks of contract ratification. Mrs Sears-Carter Wells asked of the challenges Courteville has encountered in accessing these Caribbean markets to introduce its systems. 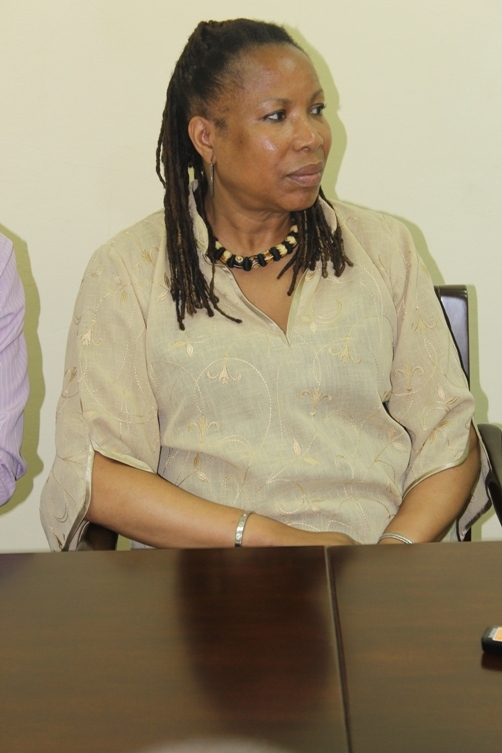 Bola confirmed this mission represented the first time this effort has been attempted but assured her that, given the cultural similarities between Africa and the Caribbean, they don’t expect the challenges to be insurmountable. 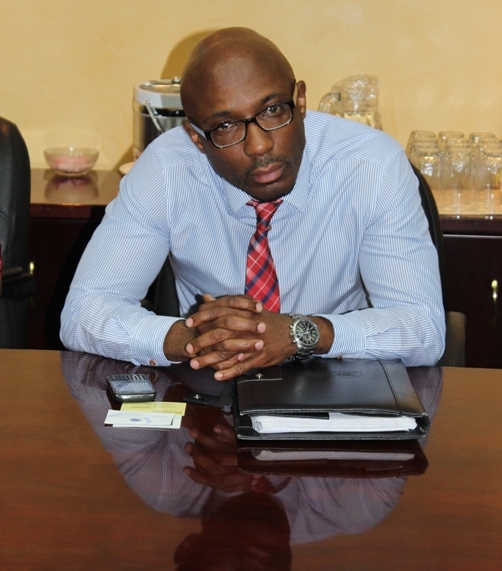 He was pleased to say that his experience in Jamaica was amazing and he looks forward to a few positive outcomes. The fact that much of Trinidad and Tobago’s ancestry is rooted in Africa, and particularly Nigeria was made by Mrs Sears-Carter Wells. 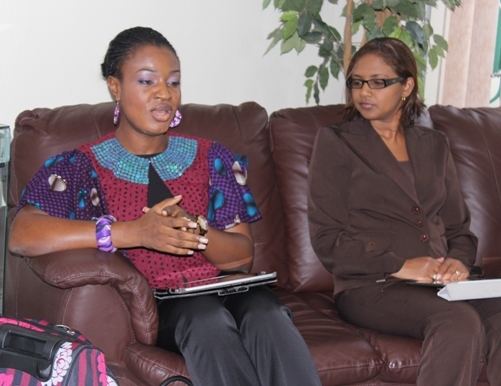 This premise was generally agreed to be useful in forging strategic business links between Nigeria and Trinidad & Tobago. Mr Akindele reiterated the point that given the common challenges, and Courteville’s proven track record, implementing appropriate systems would not be problematic. 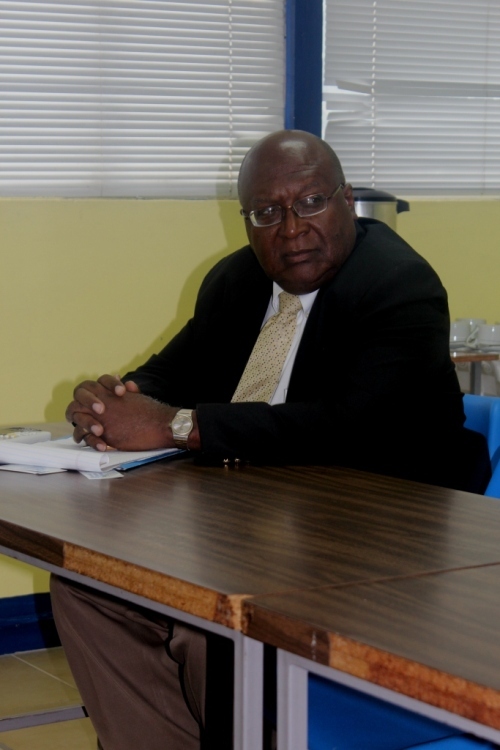 Mr Jerome Chambers, Chief Executive Officer, Going Global Ltd, with an interest in employing a robust IT system to properly streamline the records of a Credit Union, asked if Courteville had any experience designing systems for law enforcement to combat drug trafficking, money laundering and terrorism financing. Mr Akindele admitted not having specific experience in this particular area but said, ‘We have the talent to design and develop a system suitable to your needs and this is on the basis of our experience sorting out the Nigeria insurance industry’s document management system in 2007’. Bola provided an undertaking that Courteville Business Solutions can deliver a suitable system within 12 weeks, should they be contracted to do it. Zeraxis’ Managing Director, Del Atah took the timely opportunity to show that his business is similar in terms of technology but different in execution. That Zeraxis specialises in back office systems, (accounting, CRM, stock, systems for light manufacturing and so on). They are experienced in working with Fortune 500 and FTSE 100 companies in the UK, France, Norway and Germany. The companies Zeraxis has worked for include but are not limited to, John Lewis, BUPA International (Saudi Arabia, Spain, Ireland), and The Economist. The concentration has now been shifted to working with SME’s globally with the view to enable to access systems the big companies use at affordable the price. 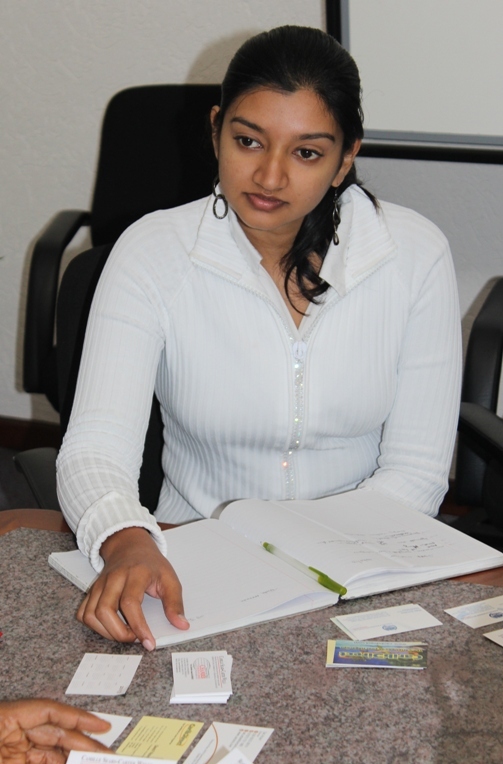 They have developed a business process matrix that looks at reducing the cost of processing. Del confirmed his company’s success at winning their first contract in Dubai while on the mission. 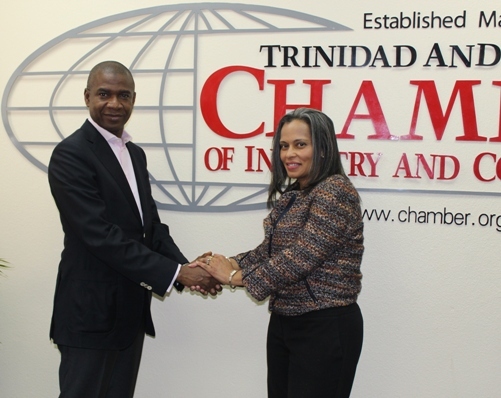 Del said he is keen to offer these services to members of the Trinidad & Tobago Chamber of Commerce. 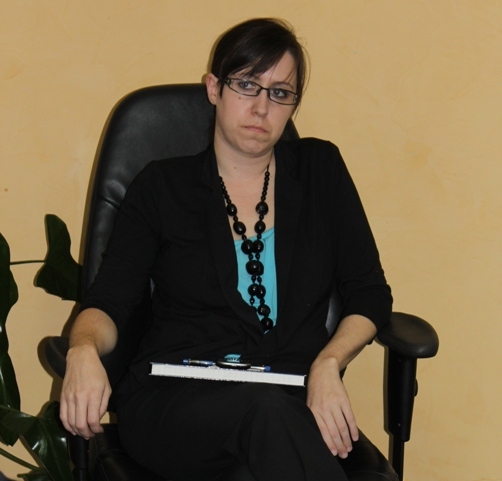 Trade and Research Economist, Stacey Honore showed her concern for how the system will be serviced and maintained. Would Courteville provide support or train people to carry out the support function. 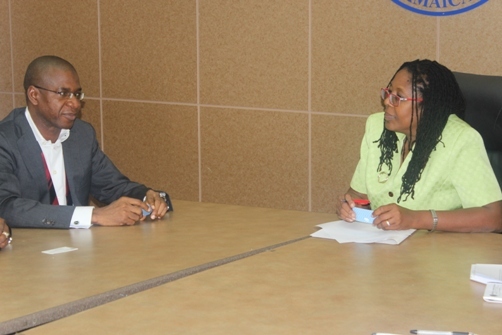 Bola assured Ms Honore that the idea is to set up operations locally and have Trinidadians effect the support service. 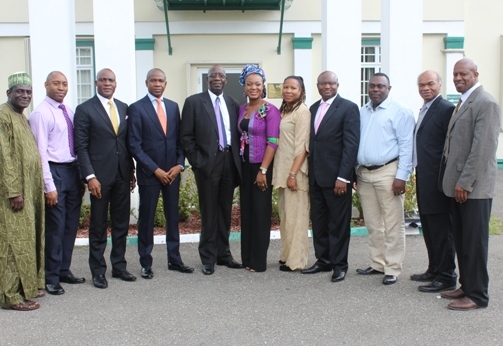 Femi also affirmed that they upgrade the system annually to ensure proper functionality. Following a scrumptious lunch at a local restaurant the delegation shot off to visit the Deputy High Commissioner for the Federation of Nigeria Mr. Lawrence T. Bade-Afuye and his Minister, Politics and Economics, Mr Nasiru Waje. Mr Femi Niyi started proceedings by apologising for the unavoidable absence of his CEO Mr Bola Akindele and introducing the remaining members of the trade delegation which was joined by Ms Renata Girod, Senior Sector Officer for InvesTT. 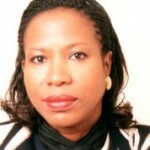 Compass Consulting CEO Mrs Tokunbo Olamiju Ajilore-Chiedu provided her concise outline of her company by emphasising her experience with facilitating the introduction of Caribbean companies to the Nigeria market and her keen interest to provide a similar function to Trinidad & Tobago companies. 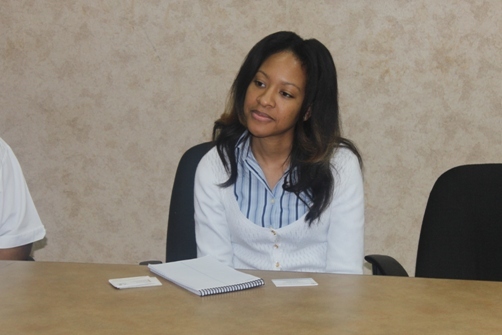 Ms Renata Girod, Senior Sector Officer for InvesTT explained her role as one that is primarily focused on attracting investment to Trinidad & Tobago. She said that to a lesser extent match making is also a function of InvesTT where they work to facilitate meetings that could result in successful trade arrangements. Priority Group International Chairman Mr Clyde Baker gave some background to the company and its role in ensuring the introduction of Courteville to the Caribbean is seamless. 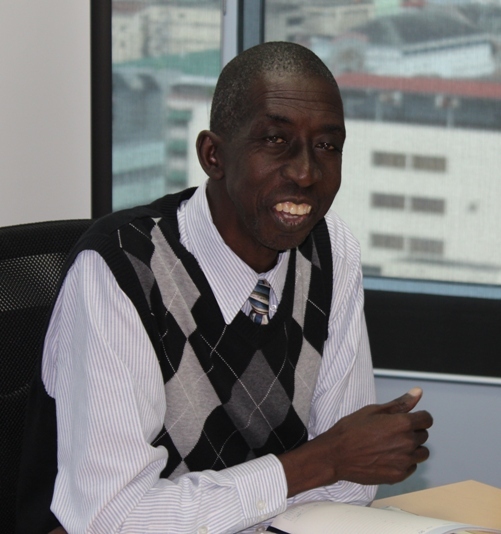 He introduced one of the local directors, Mr Moriba Baker as being key to Courteville’s transition into Trinidad & Tobago, when the time comes. The Deputy High Commissioner Mr. Lawrence T. Bade-Afuye thanked the delegation for the visit and said he was delighted as it was significant at this time given the new thrust by the Nigerian president, Hon. 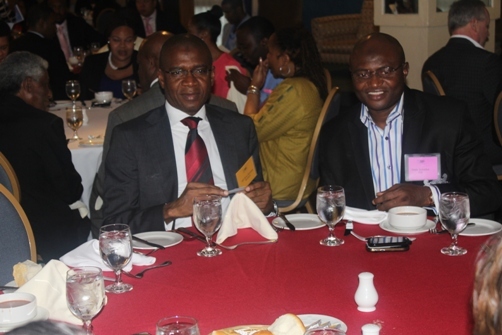 Goodluck Jonathan to firm up trade relations between Nigeria and Trinidad & Tobago. 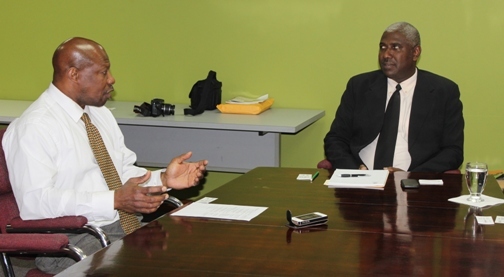 He said that the Caribbean region is considered very important to African Union so much so that in 2005 that body declared the Caribbean the 6th Zone of the African Union. The Deputy High Commissioner Bade-Afuye said the historic affinity between both countries is a prescription for intense and focused bilateral discussion. He announced that the earlier Trade commission between Nigeria and Trinidad & Tobago of 2000 is being revisited under instruction from the president who jointly agreed with Trinidad & Tobago President Kamla Persad-Bissessar to pursue renewed talks. 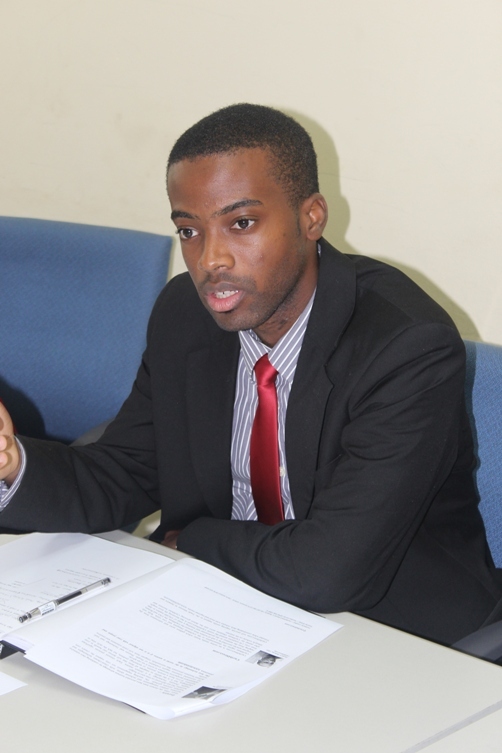 He has confirmed seeing the new draft agreement and is excited about its possible ratification in March 2013. One key component of the new Trade Commission that will have scope for other Caribbean countries, is the establishment of an air link between Lagos and Port of Spain. Though he concedes bringing about this ambitious initiative for the benefit of both territories would prove exceedingly difficult, primarily due to pressures from agents long associated with the mapping and management of air routes, he’s convinced that with the stated commitment and obvious passion demonstrated by both leaders for this venture, will bring about success. Should this venture succeed it is expected to extend to New Delhi. 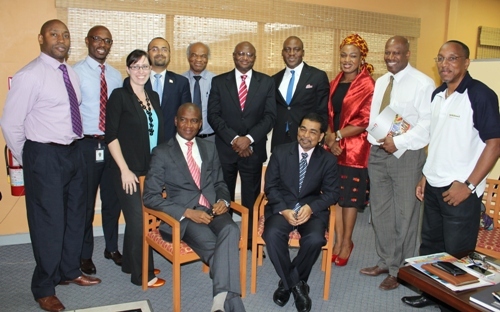 The Deputy High Commissioner expressed again his delight at receiving the delegation and had provided Priority Group International an undertaking in principle to support all efforts to engender trade between Nigeria and Trinidad & Tobago and has assigned his Minister for Politics & Economics to the Courteville team until they depart Trinidad on Tuesday January 28th. The final meeting of the day was with the Business Development Company Limited. 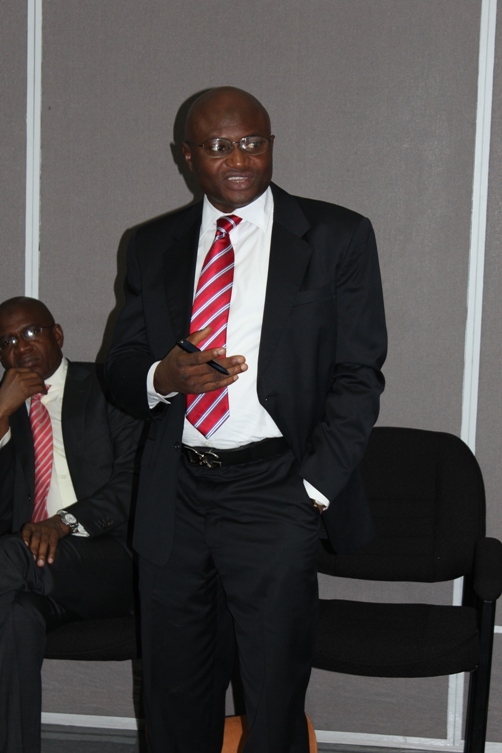 Mr Brian Benjamin, Project Manager welcomed the delegation and expressed his pleasure at meeting everyone. Mr Denis St Bernard led the introductions by speaking about Priority Group International’s role in making the trade mission possible. Mr Femi Niyi, Executive Director (Projects , Strategy and Research, Courteville Business Solutions PLC, gave a synopsis of the Courteville offering and highlighted the rationale for the trade mission – to explore opportunities to work with public or private sector organisations needing data management processing systems. Mr Clyde Baker, Chairman Priority Group International; Del Atah Managing Director Zeraxis, Mrs Tokunbo Olamiju Ajilore- Chiedu, CEO Compass Consulting and Mr David F. Roberts, CEO CaribDirect.com described their companies outlining their USP’s and the relevance of their input to the trade mission. Mr Benjamin set out the vision for the BDC as ‘To be the catalyst for growth and sustainability of businesses in Trinidad and Tobago leading to their international competitiveness’. He mentioned that the day of the meeting was a transition period for the company and further provided a historical perspective of the organisation starting from the now defunct Small Business Development Company. 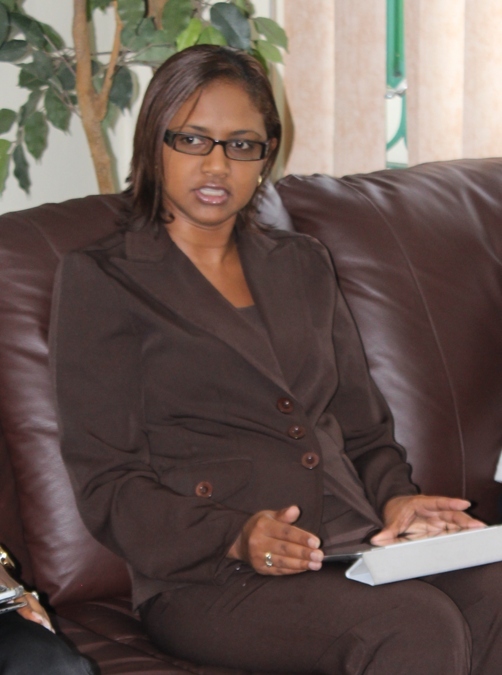 In 2002 government found a niche for small and micro enterprise financing and created NETCO. The Small Business Development Company now became the Business Development Company with a mandate to deal with Medium and Large enterprises. Mr Benjamin said, ‘The company is now as of today Friday 25th January called ExporTT and is responsible for focusing on promoting exports in the non-oil sector. 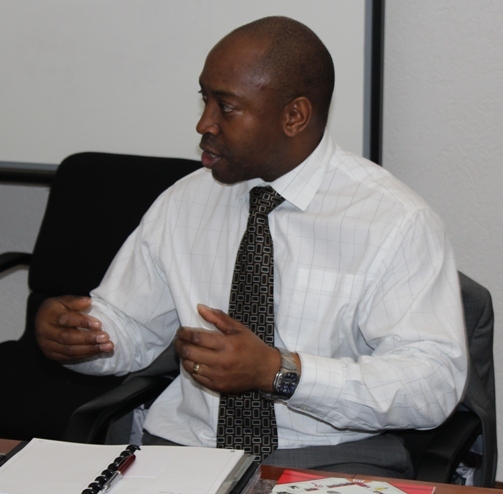 The other services previously offered to Medium to Large companies under BDC are on hold until further notice’. On this basis Mr Benjamin is convinced there are innumerable opportunities for ExporTT and Courteville to work together and charged Priority Group International, ‘Don’t let the tea get cold…’ Brian also said, ‘I hope the invitation to the Trinidad private sector to participate in the upcoming trade mission to Africa in June comes to ExporTT…we need to find a way to work together and I look forward to further collaboration’. 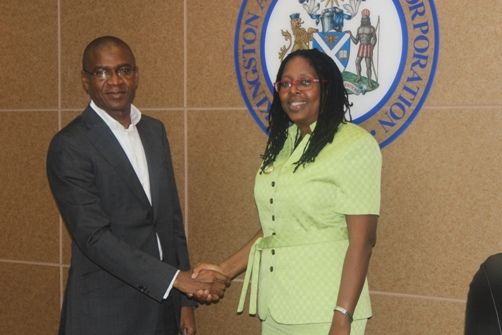 On Thursday 24th January the Africa meets the Caribbean trade mission paid a courtesy call on Her Worship the Mayor of Kingston Councillor Angela Brown-Burke and the Town Clerk Town Clerk Mr Errol Greene JP. and at her office. 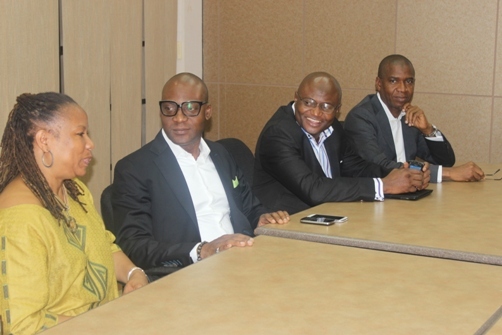 The trade mission team that greeted the Mayor comprised Mr Bola Akindele Group Managing Director, Courteville Business Solutions PLC, Mr Femi Niyi, Executive Director ( Projects , Strategy and Research, Courteville Business Solutions PLC, Mr Wale Sonaike,Deputy Managing Director (AutoReg Franchise), Mr Wole Oyewo, Courteville’s Communications consultant, Mr Del Atah, Managing Director Zeraxis, Mr Clyde Baker, Chairman Priority Group International and director CENUK: Ms Claire Jackson Operations Manager, CENUK and the CaribDirect.com team. Mr Bola Akindele took the opportunity to commence proceedings by thanking the Mayor for receiving his party from Nigeria. 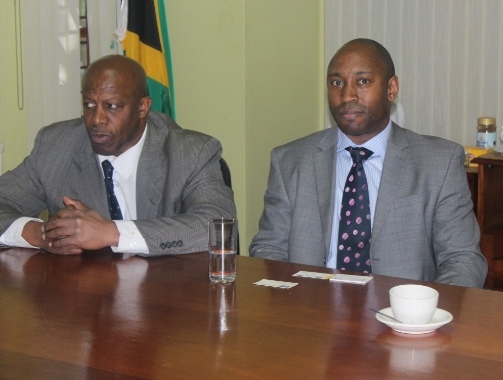 He praised the efforts of Priority First UK and their affiliate the Caribbean Enterprise Network (CENUK) for making the trade mission possible. He said, ‘I bring you greetings from the Village…as you know you all come from Ebo stock.’ to which the Mayor agreed and laughed heartily. 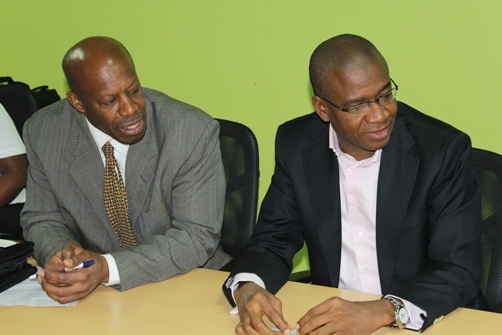 Bola suggested that the challenges of Jamaica are very much the same as those in Nigeria and this presents a unique opportunity for Jamaica to benefit from the many successes Courteville Business Solutions PLC has achieved over the years. 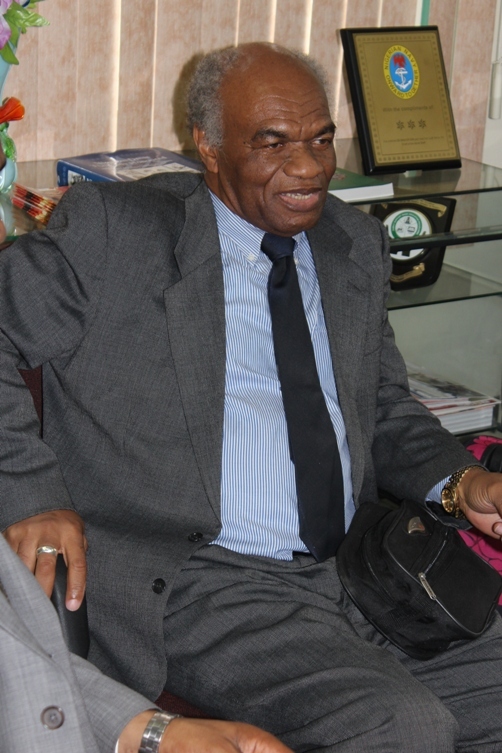 Though he recognised the nature of the visit to the Mayor’s Office being one premised on establishing cordial relations, he was curious about the general workings of the organisation and gleaning some idea of the commercial challenges that Courteville may be best placed to provide solutions to. As a municipality part of our remit is to ensure our businesses are adequately facilitated…local economic development is paramount and therefore any activity that is going to add to growth, increase GDP and so on will be welcome and supported by my office wholeheartedly’. 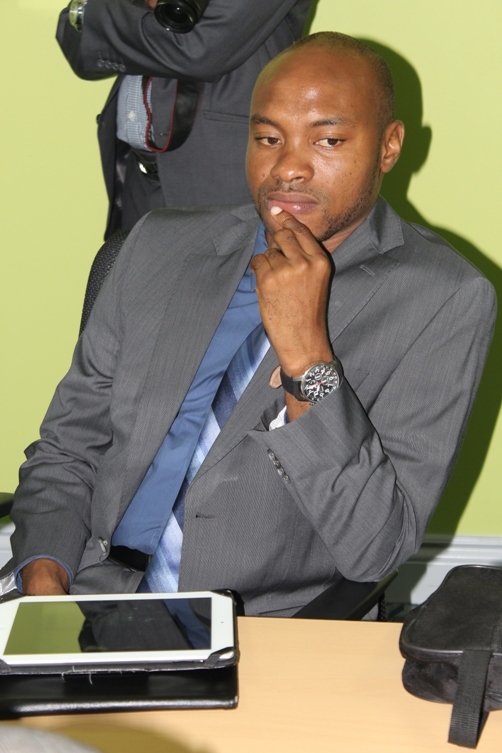 Mr Del Atah, Managing Director Zeraxis quickly alerted the Mayor to his Nigerian roots and deep Jamaican connection through his wife and provided a concise description of his business while rendering a synopsis of the specialist IT services it provides. This introduction was followed by David F. Roberts, Publisher of CaribDirect.com who outlined the remit of the organisation and its relevance to the trade mission. 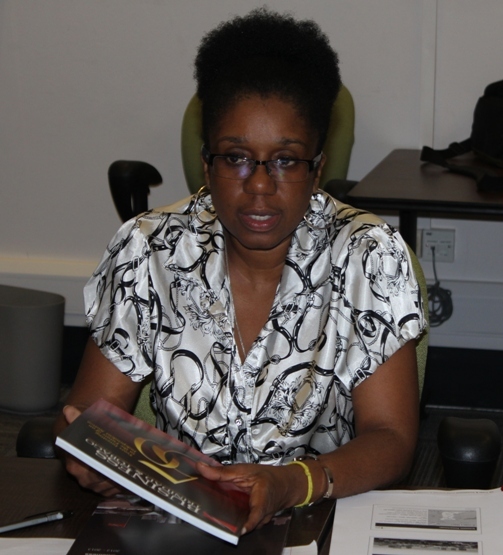 Representing CENUK , Ms Claire Jackson, Operations Manager and coordinator of the Africa meets the Caribbean trade mission, and Jamaican by birth made it clear that Jamaica, for both personal and professional reasons was deliberately selected to be the first country to benefit from this new venture. At this point Her Worship Councillor Brown-Burke mentioned having received a UK delegation from West Midlands UK and that there must be something good happening for Kingston and she was pleased. Mr Femi Niyi, Executive Director (Projects , Strategy and Research, Courteville Business Solutions PLC, posed the question about Taxes and what method is used to collect vehicle and other municipal taxes. 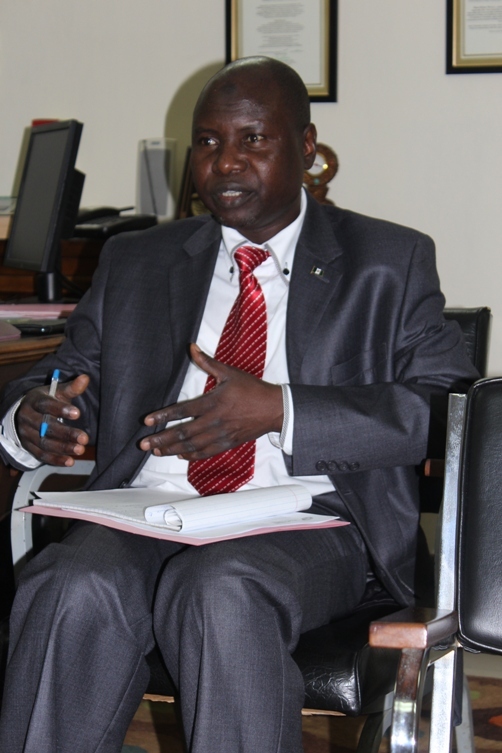 He described the efficiencies of Courteville’s flagship AutoReg vehicle registration and documentation program. 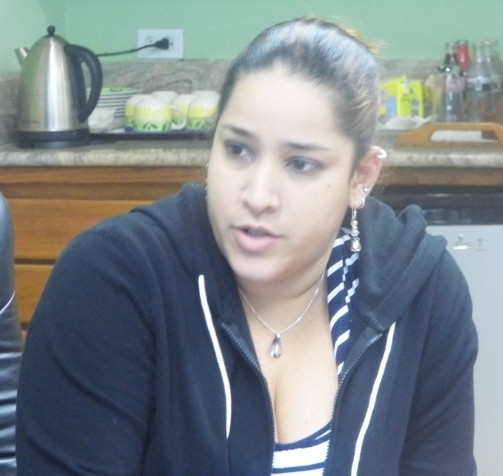 Her Worship Councillor Brown-Burke indicated her interest to receive further details of the many programs that Courteville offers with a view to examining their suitability and possible implementation. 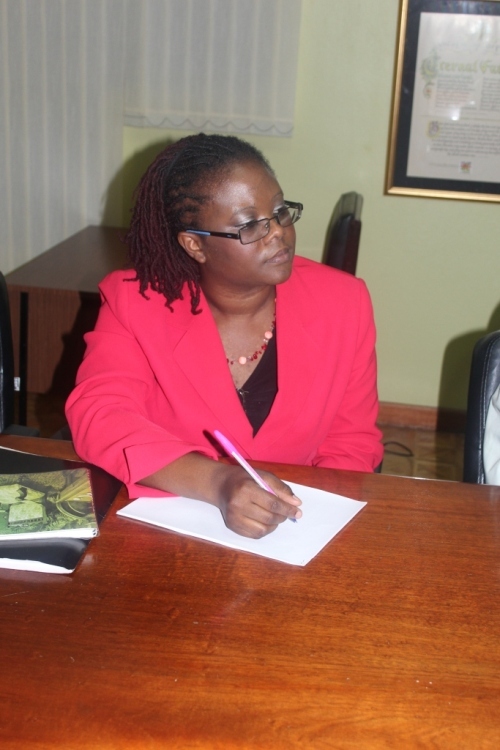 She pledged her support and looks forward to continuing discussions. The second and final meeting of the day was with President of the Private Sector Organisation of Jamaica (PSOJ), the business advocacy organisation of Jamaica, Mr Christopher Zacca. 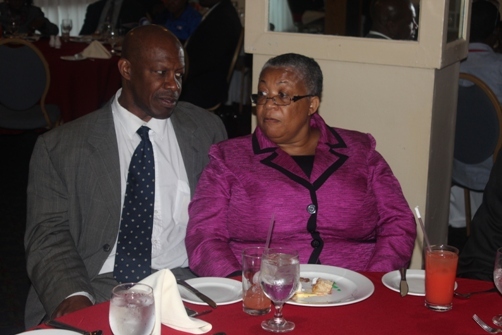 Mr Zacca, one of Jamaica’s most prominent and prolific businessmen was accompanied by the Chief Executive Officer, Mrs Sandra A.C. Glasgow and Chairman of KS Chemical Distributors Ltd., Mr Elon Beckford one of Jamaica’s longest serving Councillors. Mr Zacca set the tone of the meeting by injecting some humour which was at the expense of the charismatic, flamboyant, and playful Mr Femi Niyi who Mr Zacca suggested needed to be kept close by as he suspected he was not one to be left unsupervised. This created much laughter and made for easy introductions. Mr Denis St Bernard, director of Priority Group International and director of the Africa meets the Caribbean Trade Mission introduced the members of the trade mission and articulated the objectives. 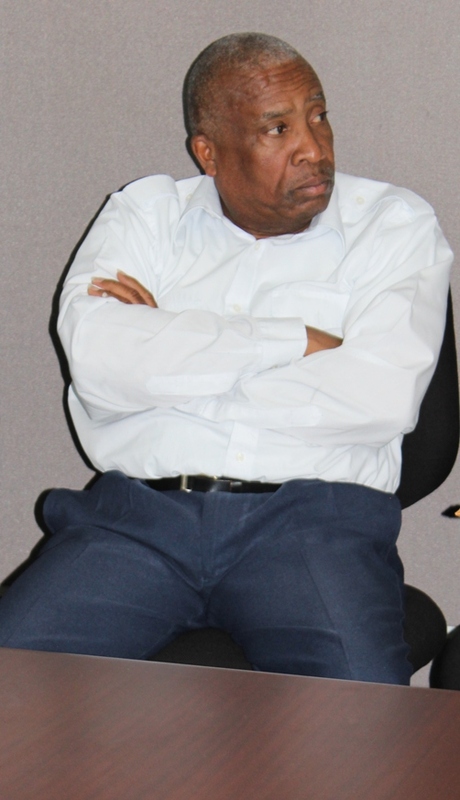 He said given the mandate of the PSOJ that a visit to Jamaica without calling upon the leaders of the PSOJ would have been foolhardy and a significant oversight. 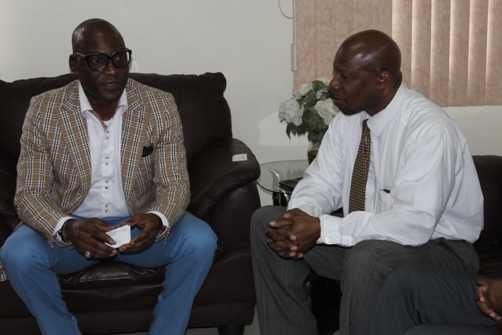 Mr Bola Akindele Group Managing Director, Courteville Business Solutions PLC expressed his particular delight at meeting Mr Zacca and his team and said that he has had very productive meetings over the four days in Jamaica. He painted the backdrop of the Nigerian economy and the fact that Nigeria’s market is ideal for investment given its size (162 million population- 20 million in its smallest state Lagos) and GDP growth at a rate of over 7% per annum. The Courteville chief provided a summary of the many services and areas of particular specialisation, data management and administration and stressed that as professional and experienced data managers they can critically assess and provide bespoke systems to solve most challenges associated with the management of large banks of data. 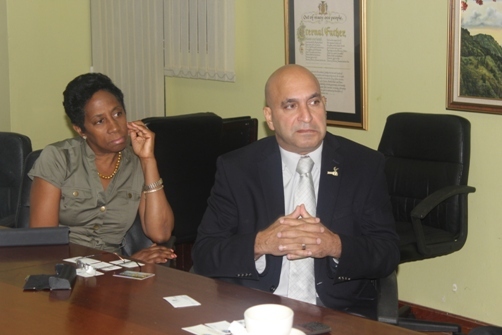 Also that he had successful meetings with the Insurance Association of Jamaica and so on. 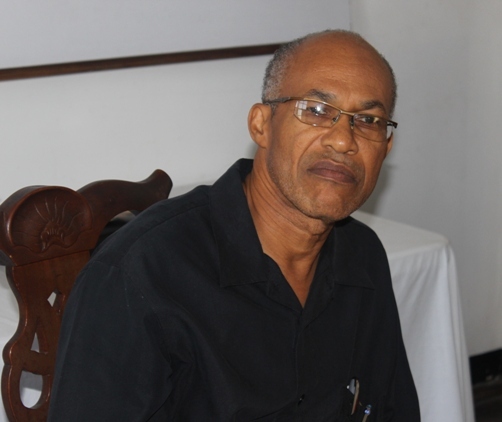 Denis St Bernard asked the critical question of what are the starting points for a lobby for South / South trade in Jamaica. 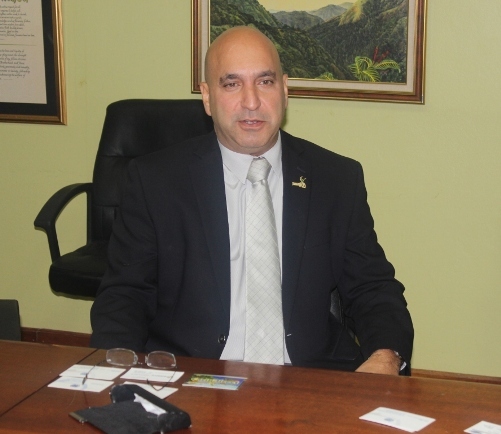 Mr Zacca responded by confirming Jamaica has traditionally looked North to North America for trade opportunities and to some extent the East to China. 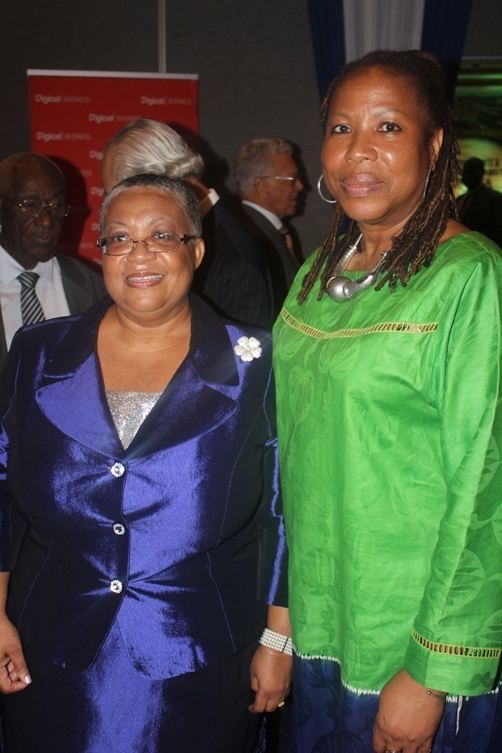 Mrs Glasgow mentioned the inroads Grace Kennedy Foods have made with entering the Ghanaian market successfully. 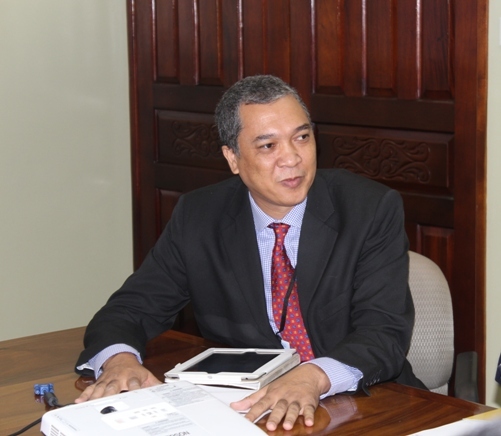 Mr Zacca stressed that he would be very interested to learn of the ideas Mr Akindele had in terms of elucidating what sustainable opportunities exist in Africa that could be explored long term for Jamaica. 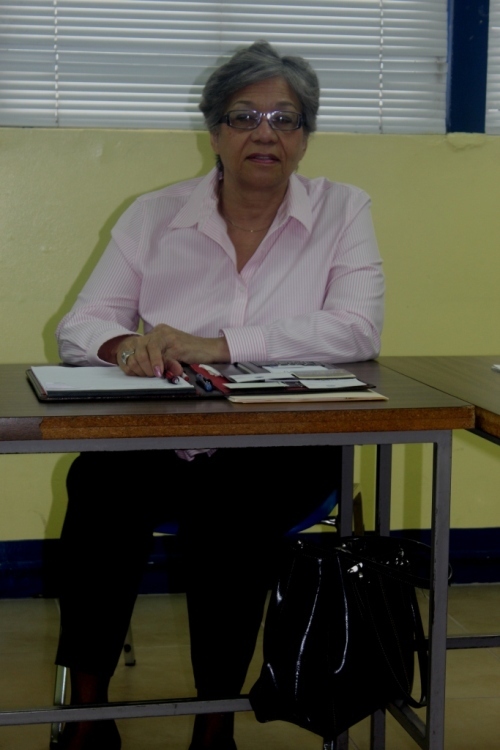 Mrs Glasgow further made the point that she thinks Jamaicans are a little timid and tend to venture into markets where there are already established connections rather than seeking to penetrate new territories. She said Grace Foods have confirmed the Ghanaian market to be extremely receptive to their products and has proven to be a worthwhile venture. 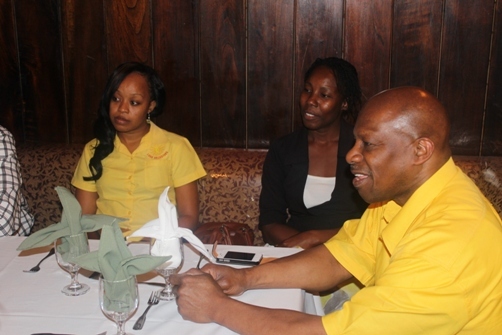 At this point Priority Group International Chairman, Mr Clyde Baker informed Mr Zacca and Mrs Glasgow of the impending trade mission to Africa in June 201 3(The Caribbean meets Africa Trade Mission) and that this would be an ideal opportunity for Jamaican companies to test the potency of their products or services in a new and vast emerging market. 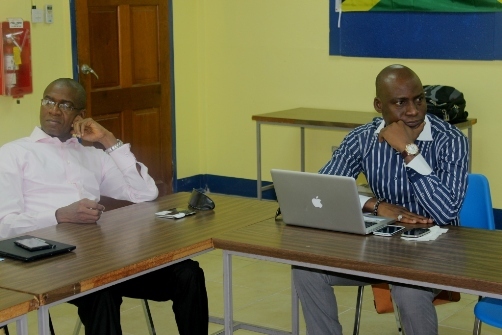 Mr Akindele and Mr Niyi together immediately challenged the commercial viability of setting up in Ghana versus setting up in Nigeria by enlightening the hosts that in Ghana foreign companies cannot ‘set up shop’ in the country without having a Ghanian on the Board of Directors or holding a significant position or stake in the company. 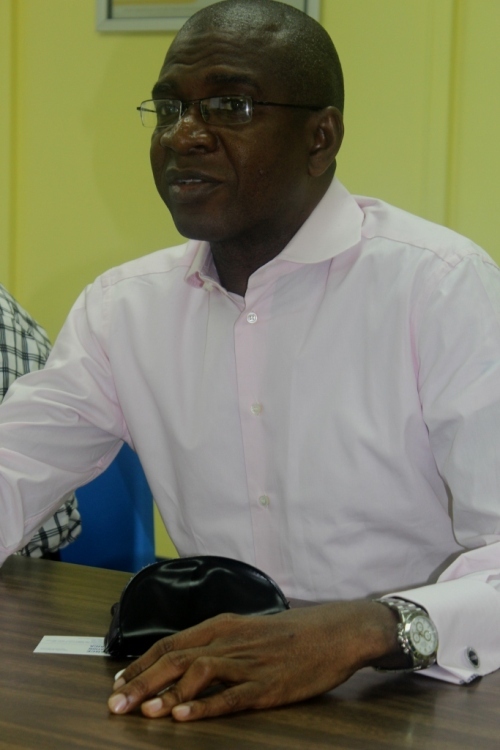 Mr Elon Beckford came to make the point that he believes it was no mistake Grace Kennedy Foods chose Ghana first but that it could be seen as an experiment preparing them to enter the Nigerian market with confidence. He also said the South / South trade opportunity is possible and would need to begin at the private sector level first through establishing the right linkages and moving from there. However, on the political side, he said Jamaica has been talking about this for many years but the global economic circumstances today are forcing political leaders across the Caribbean to take these opportunities more seriously and we should see movement very soon. Mr Denis St Bernard announced that Priority First UK / CENUK are in the process of planning an African Caribbean Expo in Jamaica later this year that will seek to showcase much of what the Caribbean has to offer to Africa. Opportunities for trade in food, low cost housing, financial services, sports and mobile money, Mr Zacca said would be excellent for Jamaica and would like to explore in some detail the feasibility of these areas with a view to initiating arrangements to commence trade. Mr Zacca implored the delegation and more particularly Courteville Business Solutions PLC, through Mr Bola Akindele to keep the lines of communication open to ensure both parties give the discussed opportunities a fair chance at success. 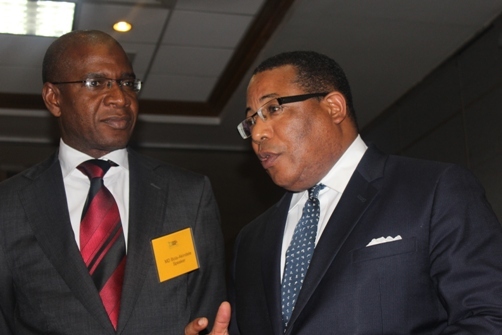 As part of the Africa meets the Caribbean Trade Mission Mr Bola Akindele was invited to speak at the special luncheon of the Jamaica Stock Exchange at the Jamaica Pegasus in Kingston. To a packed room of influential public and private sector individuals including the Minister responsible for the Ministry of Industry, Investment and Commerce, Hon. G. Anthony Hylton,MP and General Manager of the Jamaica Stock Exchange, Mrs Marlene street Forrest, Bola introduced Courteville Business Solutions PLC as a 21st Century company listed on the Nigeria Stock Exchange doing revolutionary things in business in Nigeria and Sierra Leone. He began by saying, ‘Greetings from the Village, Greetings from home.’ he further stated that given the population of Nigeria being 20% of the continent of Africa that Nigeria is Africa, meaning that the influence of Nigeria resides in every corner of Africa. He expounded on the tremendous opportunities that exist in a dynamic African market, Nigeria, that is growing at a rate of 7% per annum, (far better than any European country) and the cultural and economic synergies that exist between Jamaica and Nigeria. Bola suggested that the role of driving a country’s economic growth should not be the government’s but that of the private sector. Governments all over the world have being doing their best to improve their economies but with very little success while private organisations are more robust, nimble and able to generate profit that will create investments that will ultimately lead to economic growth and development. With Nigeria’s GDP contributing 50% of the GDP of the entire African continent, Nigeria is an economic giant that is growing constantly. 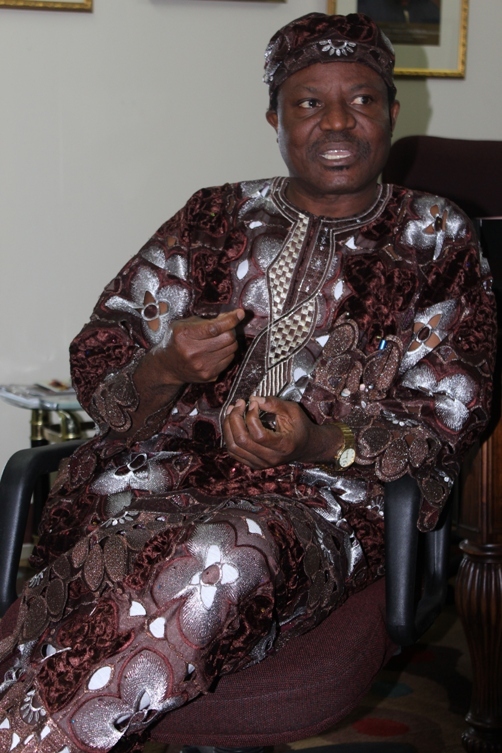 Mr Akindele affirmed that Nigerians in the United Kingdom outspent the Chinese, the Arabs, the Indians and the Russians in 2012. 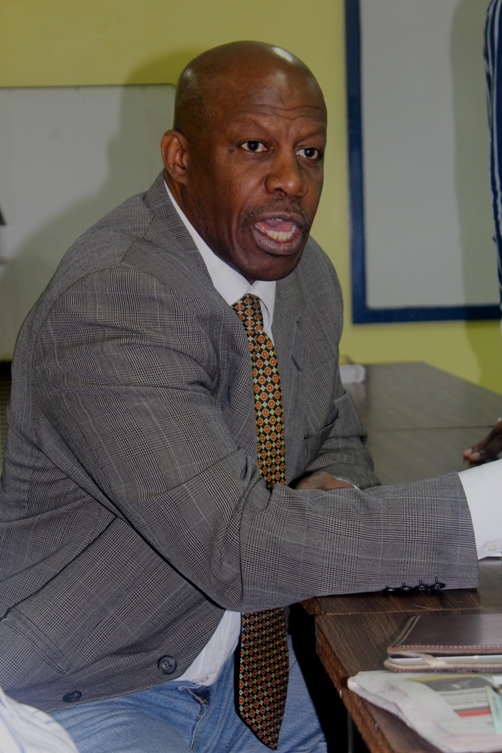 He was very adamant that if Jamaican businessmen and women are serious about growing their businesses they need to look to the South and not the North. Following the presentation which was well received, Bola answered questions from the gathering and networked with the guests for sometime before meeting briefly with the Minister responsible for the Ministry of Industry, Investment and Commerce, Hon. 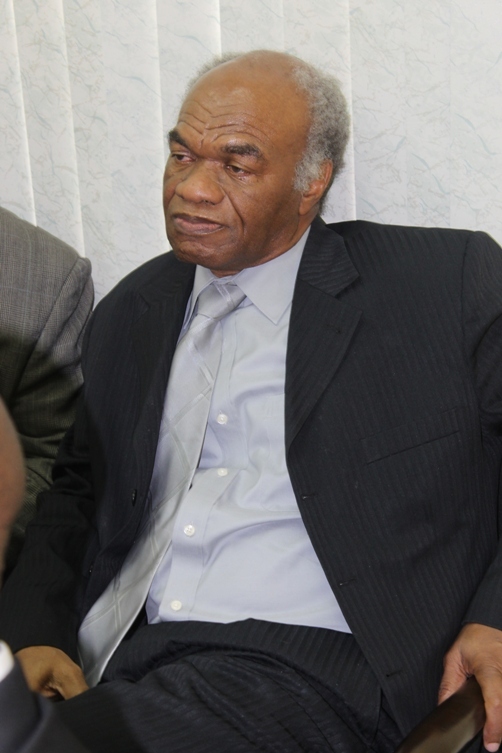 G. Anthony Hylton,MP. 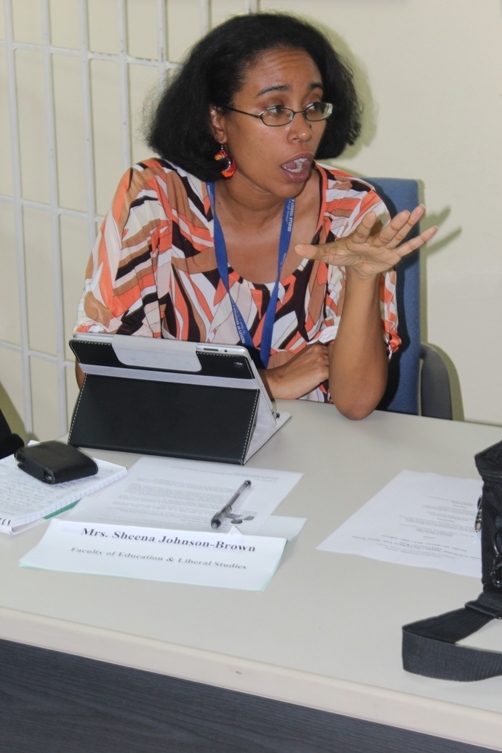 It’s Day 3 and the pace of the Africa meet the Caribbean trade mission continues. The first meeting of the day was with the Insurance Association of Jamaica headed by Mr Orville Johnson, Executive Director. 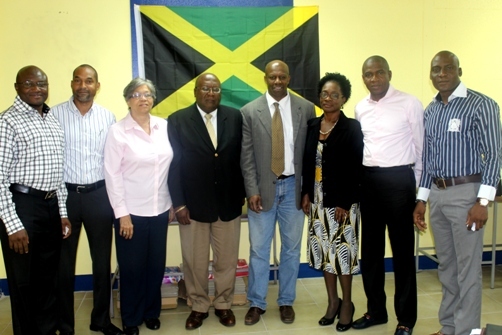 Orville and his team which comprised Mrs Alicia Browne, Assistant General Manager, JN General Insurance Company Ltd., Mrs Joan Kenyon, Manager, Retail Risk Department, BCIC and Mr Michael Lewis, Vice President, IT and Special Projects, Advantage General Insurance Company. 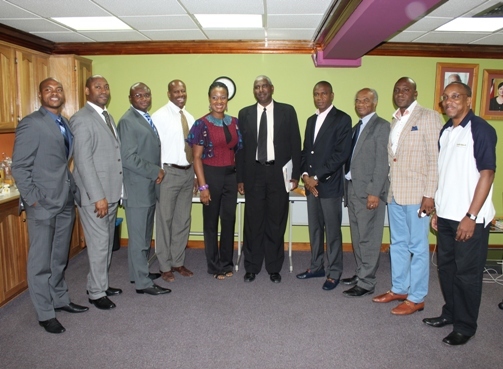 The insurance professionals met with the following members of trade delegation, Mr Denis St Bernard of Priority First UK, a subsidiary of Priority Group International; and Caribbean Enterprise Network (CENUK), Mr Bola Akindele Group Managing Director, Courteville Business Solutions PLC, Mr Femi Niyi, Executive Director ( Projects , Strategy and Research, Courteville Business Solutions PLC, Mr Wale Sonaike,Deputy Managing Director ( AutoReg Franchise ), Mr Wole Oyewo, Courteville’s Communications consultant, and the CaribDirect.com team. The usual introductions were done lead by Denis St Bernard who explained the background to the trade mission by enlightening the gathering on Caribbean Enterprise Network (CENUK’s) remit to provide specialist business support to Caribbean businesses, enabling the to access global markets. He stressed how CENUK’s role in the Diaspora made this trade mission possible as CENUK in association with its strategic partner, Priority First UK work to provide Caribbean SMEs with opportunities otherwise unavailable. 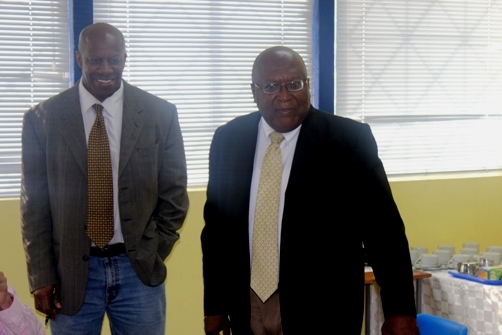 Denis assured the gathering that his relationship with the Insurance Association of Jamaica and Mr Orville Johnson go way back and that Orville is a significant pillar in the Jamaica insurance industry and an invaluable resource to have at the meeting. 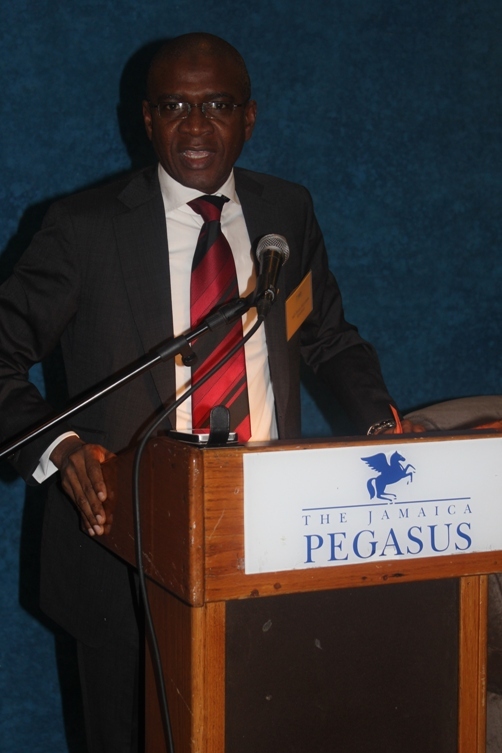 He emphasised the relevance of the Courteville mission to the Caribbean as critical particularly from the point of view of the company’s AutoReg programme that is making waves in Nigeria and can be a critical asset to Jamaica’s insurance industry. Without delay Mr Femi Niyi, Executive Director ( Projects , Strategy and Research, Courteville Business Solutions PLC took the podium and introduced Courteville Business Solutions PLC as the leader in its field of IT business solutions in Nigeria. 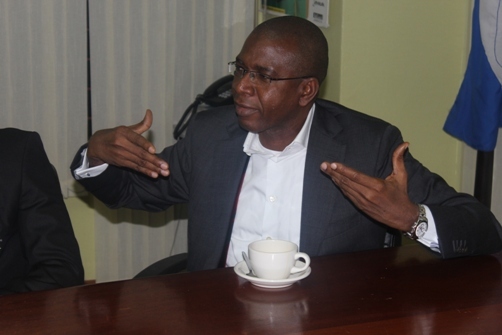 He informed the insurance practitioners that this distinction must be taken into context by outlining Nigeria’s population of 162 million people with more than 20 million living in Lagos, a state just about the size of Jamaica. Femi made it clear that the general challenges of Jamaica, learnt over the past few days, are very similar to those of Nigeria and that the challenges peculiar to the Jamaica insurance industry (compliance, lack of transparency, unlicensed and uninsured drivers and so on) are almost on all fours with those Nigeria experienced some seven years ago. 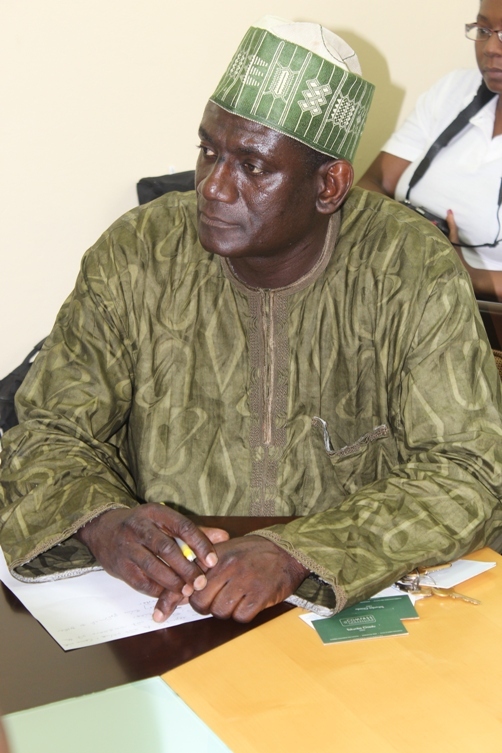 Femi mentioned Tax Administration Consultancy, bespoke software design and development and the famed AutoReg vehicle license system, the automated vehicle license registration and renewal system, which is designed for all vehicle owners within a state to register or renew their vehicle license hassle free and within record time. The point was made that Courteville manages a database of 45 million records of which 15 million are registered vehicles on the road. 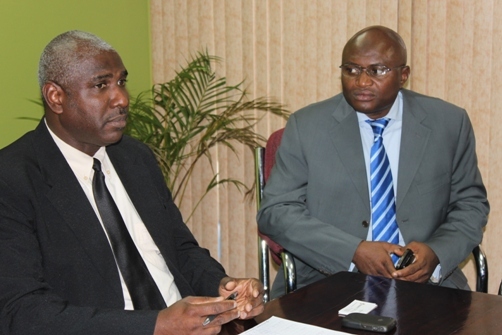 Femi proceeded to implore the insurance industry experts present of the need to consider the verifiable successes Courteville has made over the years for implementation in the Jamaica insurance industry. He attempted to allay their anxiety by promising to undertake the assignment without any upfront payment but allow Courteville to do what they do best to demonstrate the effectiveness and reliability of the system. To this Managing Director Bola swiftly responded by saying that it is in the interest of all parties; the police, insurance companies, brokers and customers to support a system that brings order to a process that protects road users. He said if it is made into law they will have to comply. Femi then cited the case of Nigeria where the head of the insurance association placed his career on the line to effect this much needed change and watched the change happen over time in spite of continuing resistance. Denis St Bernard interjected to point out that for this to be undertaken seriously ‘political will’ is required where politicians will see the value of this measure and overtly support it. 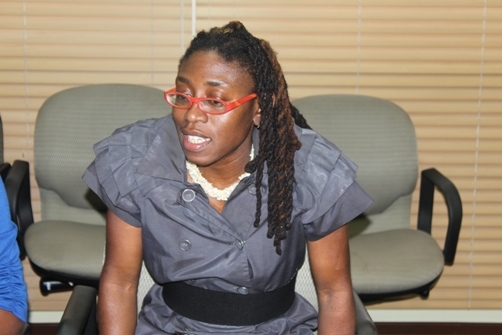 Mrs Alicia Browne asked how long would the system take to be implemented to which Femi replied, ‘eight weeks.’ It was therefore agreed that the Insurance Association of Jamaica would examine the Courteville AutoReg platform more closely with a view to ascertaining whether it’s more cost effective and timely. 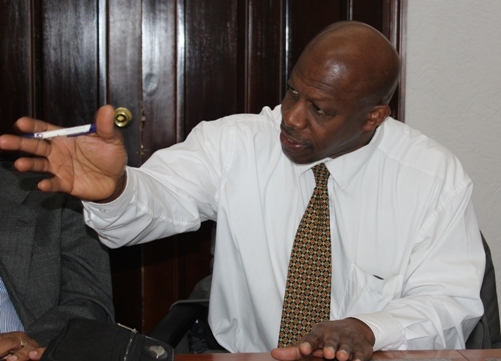 The final meeting of the day was led by Denis St Bernard of Priority Group International, purveyors of various insurance services on the island, the meeting was begun without delay.with the Taxi Drivers Association headed up by Mr Hurshel Cyrus, director Alyjaz Business Solutions at the Four Seasons Hotel, Kingston. 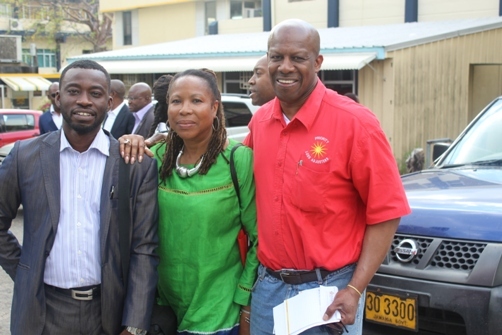 Hurshel’s assistant Ms Shelly-Ann Thorne accompanied him. 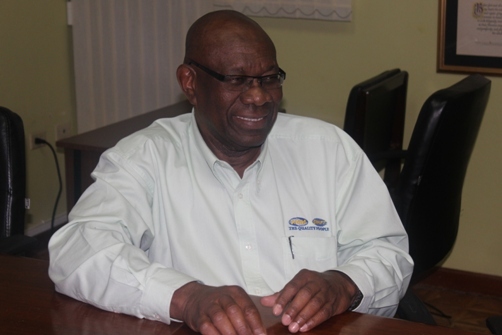 Hurshel went on to describe the association as having over 30,000 owner members who apply through the association to the Transport Authority for their Public Passenger Vehicle License (PPV) which allows the association to earn an income. The challenge for the association is that the Transport Authority does not regulate the behaviour of drivers nor do they require drivers to be members of the association. This situation finds many drivers who are ex convicts, rapists, and so on being members of the association. We’d like to implement a system that will essentially grade drivers according to background and other factors. 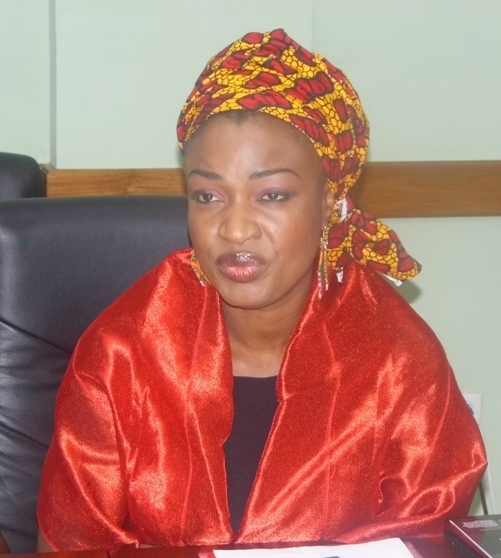 In response, Bola Akindele, managing director of Courteville assured Hurshel that they can provide a bespoke program that will address this problem under a special arrangement that does not require payment upfront. An agreement in principal has been reached and both parties will continue the collaboration and negotiation through Denis St Bernard of Priority Group International. The momentum of the Africa meets the Caribbean Trade Mission in Jamaica picked up with an early morning meeting at the Small Business Association of Jamaica. 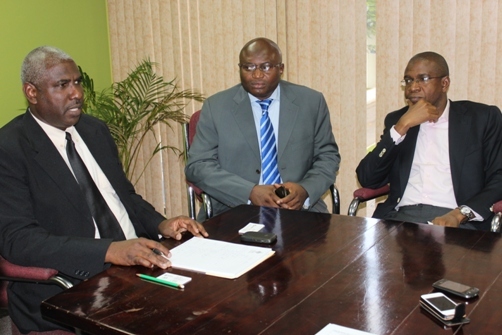 This meeting coincided with a prearranged radio interview on Power Radio 106 FM where Denis St Bernard, director of Priority Group International and director of the Africa meets the Caribbean Trade Mission spoke at length with Group Managing Director, Courteville Business Solutions PLC and head of the Nigeria delegation, Mr Bola Akindele. President of the Small Business Association of Jamaica Dr Meredith C. Hypolite Derby received the trade delegation which included Mr Denis St Bernard of Priority First UK, a subsidiary of Priority Group International; and Caribbean Enterprise Network (CENUK), Mr Bola Akindele Group Managing Director, Courteville Business Solutions PLC, Mr Femi Niyi, Executive Director ( Projects , Strategy and Research, Courteville Business Solutions PLC, Wale Sonaike,Deputy Managing Director ( AutoReg Franchise ), Mr Del Atah, Managing Director Zeraxis, Mr Clyde Baker, Chairman Priority Group International and director CENUK: and the CaribDirect.com team. Accompanying Dr Derby was small business owner and upholsterer, Mr Oswald Smith. 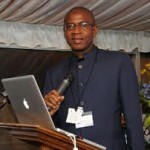 Dr Derby wasted no time by setting the background of how Jamaican business owners, to a large extent view Nigerians given their long standing reputation for being clever and thrifty with a knack for using unconventional means to make money. 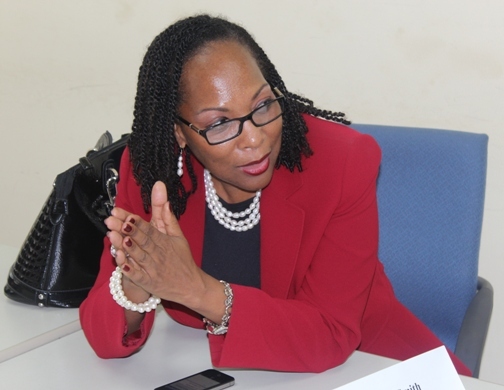 She said in spite of this, she has warned her colleagues in business in Jamaica that there are many Nigerians who are honest law abiding citizens. Dr Derby drew a parallel with Columbia, widely known for cocaine production and distribution, as a country with many other valuable natural resources that account for a significant percentage of its GDP. Dr Derby mentioned her delight on meeting the trade delegation outlining the many positive things happening to the Small Business Association of Jamaica including the recent acquisition of much needed funding for the organisation. 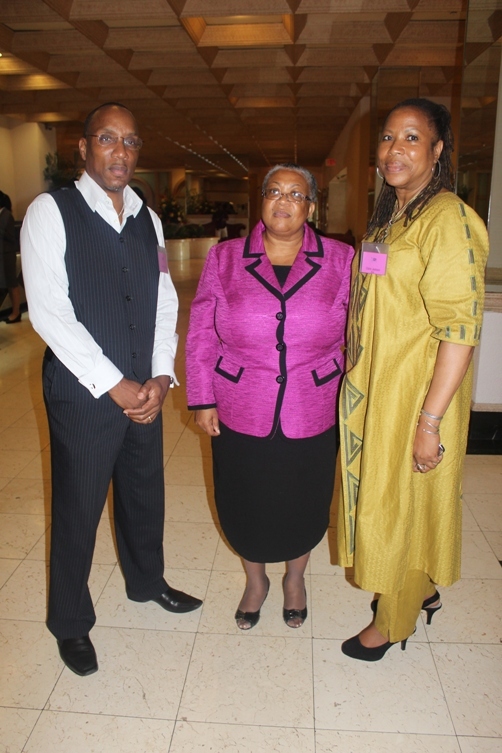 She expressed her interest to explore mutually beneficial programmes with Nigeria. Mr St Bernard set thing off by introducing the team and asking each member to introduce themselves. 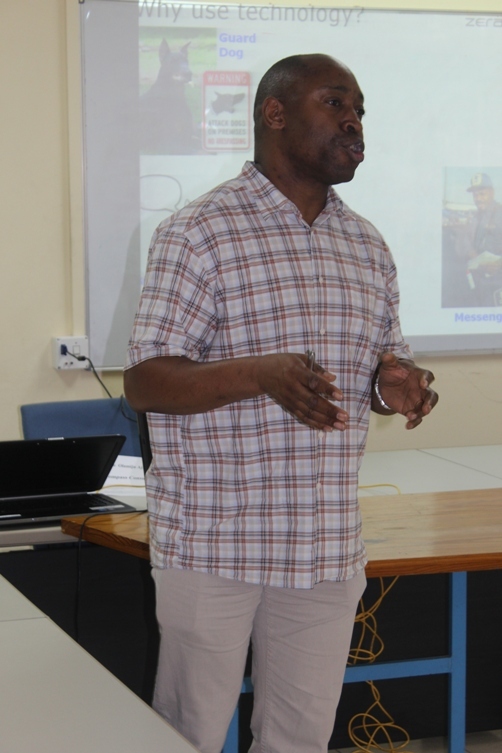 Mr Bola Akindele took the opportunity following his introduction to acknowledge the stigma associated with his country, a situation that is gradually improving, and outlined his present experience of being the recipient of spam emails and money scams from other countries. 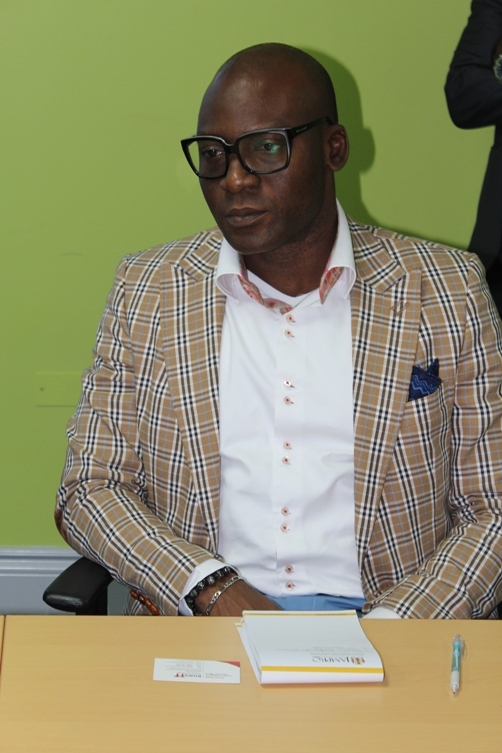 Bola went on to describe Courteville’s profile and indicated his confidence that with his 7 year tenure and the listing on the Nigerian Stock Exchange, Courteville Business Solutions can be a credible partner to Small Business Association of Jamaica. 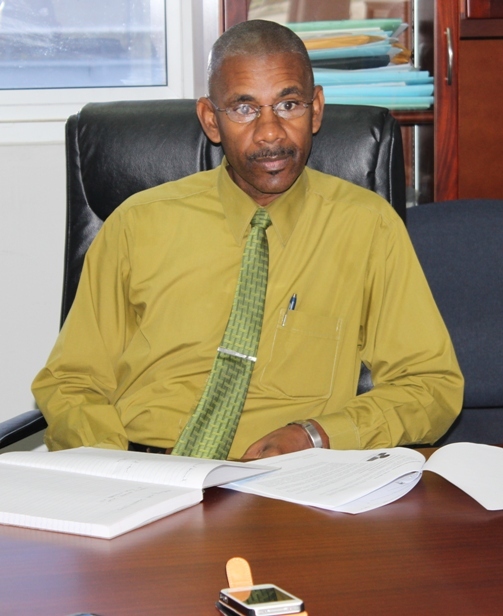 He invited Dr Derby to carry out the necessary due diligence to provide the necessary comfort for the SBAJ’s membership to accept the opportunity to work with the Courteville Group. 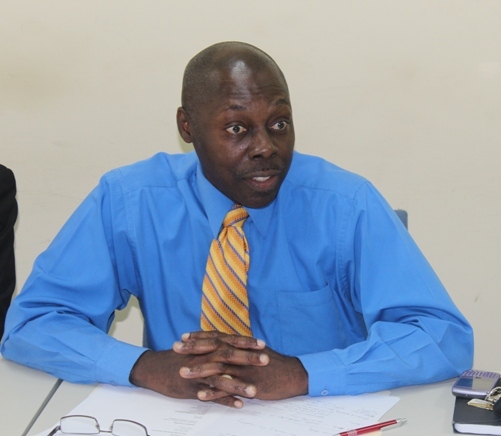 ‘Though the SBAJ has been in operation for many years with a fairly large membership base, the organisation suffers from a lack of funding associated with insufficient membership contributions,’ Dr Derby said. This situation has come about through competition from other membership based organisations and many members falling behind on membership dues for many reasons including financial difficulties, membership with other similar organisations, payment delinquency among others. Mr Femi Niyi, Executive Director ( Projects , Strategy and Research, Courteville Business Solutions PLC quickly asked if the organisation had a comprehensive database of members, to which Dr Derby replied, ‘No.’ Femi explained how critical such a database was to a membership organisation such as the SBAJ, stating that such a system could have a very positive impact on the functionality of the organisation as well as be monetized over time for the benefit of the membership. Mr Smith reiterated the point that small businesses are the life blood of the Jamaica economy and need to be encouraged and sustained and that any system that can assist with this would be welcome. 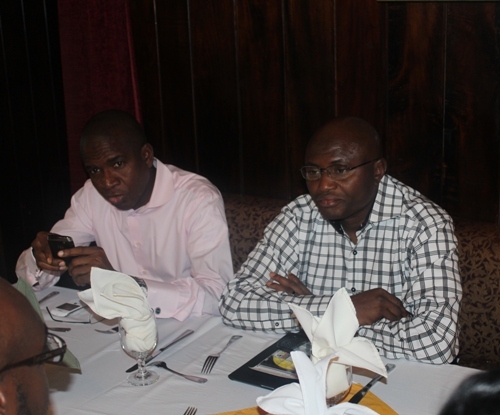 Bola described how effective Courteville has been as a business solutions provider with a specialty in Information Technology in Nigeria and Sierra Leone. 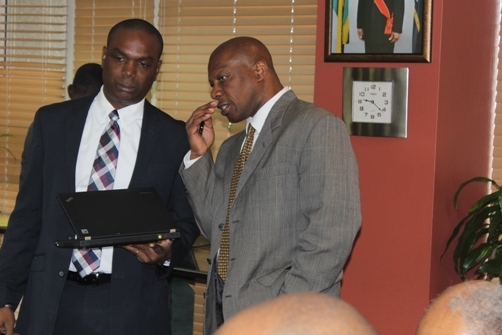 He emphasised the point that the problems of Jamaica generally, and the SBAJ are not dissimilar to those in Nigeria, a country of 162 million people and offered a commitment to help the SBAJ overcome their challenges with a solution he’s confident will work perfectly. 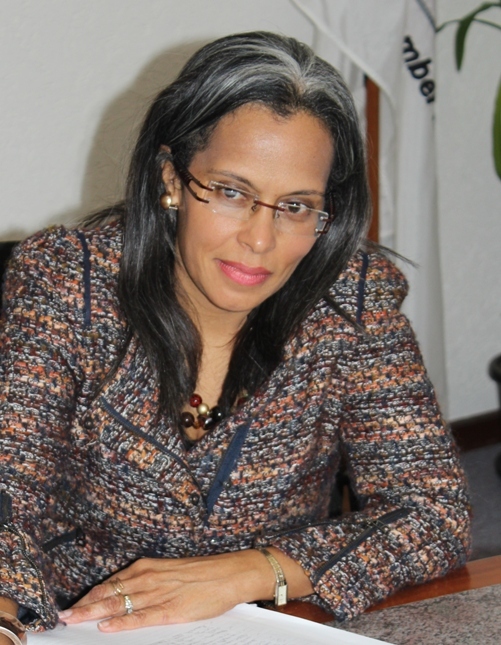 Dr Derby recognised the synergies, the opportunities to transform the fortunes of the SBAJ and announced her interest to pursue further discussions with a view to entering into a formal arrangement with Courteville. 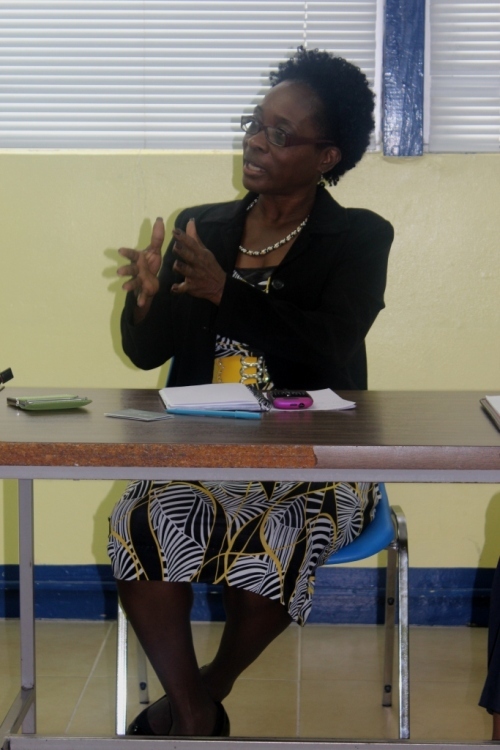 She suggested that Courteville use Jamaica as the pilot for establishing trade links with the Caribbean given their intention to invest over USD$600 million over five years. 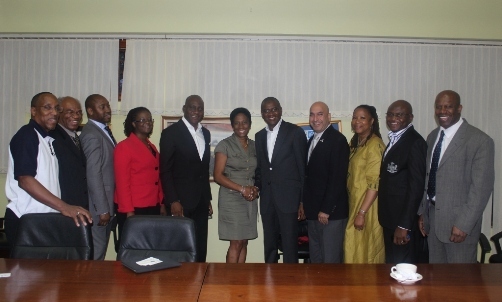 Later on that day the delegation met officials from the famed University of Technology (UTECH), the institution that has produced international star athletes such as Double Olympic 100m gold medallist Shelly-Ann Fraser-Pryce, Asafa Powell, Yohan Blake and the charismatic current world record holder Usain Bolt, among others. 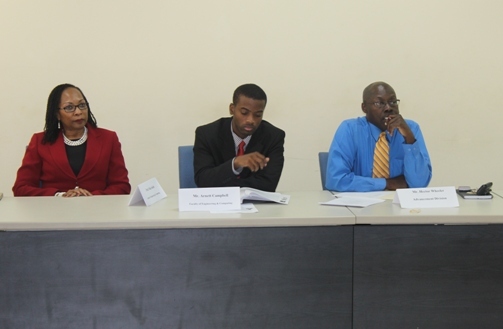 In attendance were UTECH representatives, Mr Hector Wheeler, Director of Advancement; Mrs Rosalea Hamilton, Vice President of UTECH and CEO of Jamaica’s Institute of Law & Economics at the University of Technology; Sheena Johnson Brown, Acting Programme Director, BA Communications, Arts & Technology; Mathew Bryan, Director UTECH SAPNA Software Development and Cheryll Messam, Alumni Relations Manager…. Mr Del Atah, Managing Director Zeraxis presented a detailed overview of his company and emphasised the need for knowledge transfer solutions aimed at meeting the requirements of local and global companies. 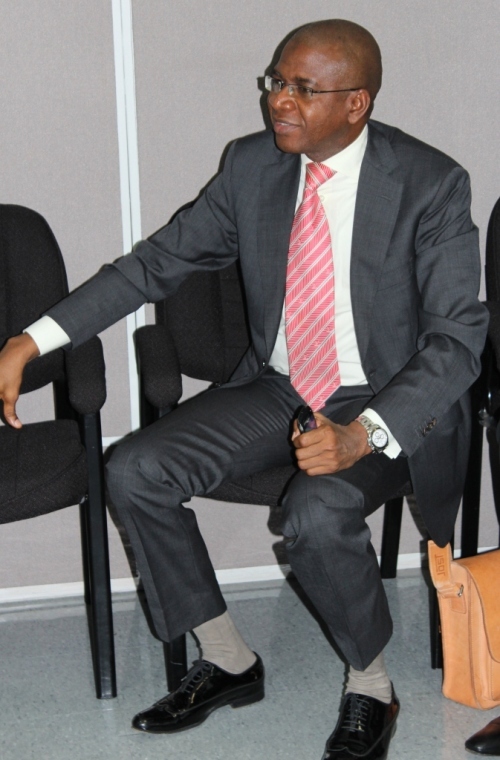 he focused on elucidating the synergies between Zeraxis and UTECH with a view to setting the stage for discussions to formalise relations that will see business students / young entrepreneurs providing much needed professional services to international clients. In response Mr Hector Wheeler whom was thankful for the level of detail contained in the presentation suggested there was certainly scope for dialogue to arrive at an arrangement that will ultimately benefit the students. 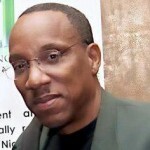 Mr Michael Steele, felt Zeraxis’ proposition should be skewed toward young entrepreneurs with a strong propensity for IT looking to access global markets should be the focus and not inexperienced students of Information Technology and business. 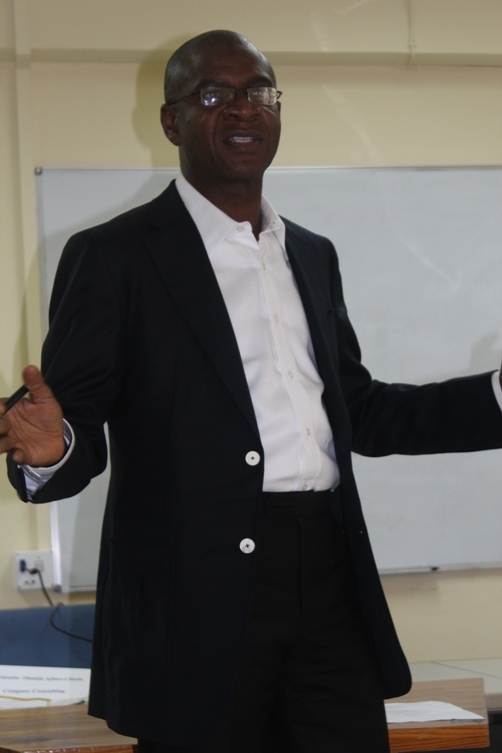 The next presentation was delivered by Mr Bola Akindele Group Managing Director, Courteville Business Solutions PLC who set out the back drop of the Nigerian education system by alluding to the fact that there are far more applicants for university places than are available something like 10,000 applications for only 1500 places. He suggested strongly that UTECH consider allowing Courteville to provide a robust online version of the existing curriculum aimed at suitably qualified Nigerian applicants. 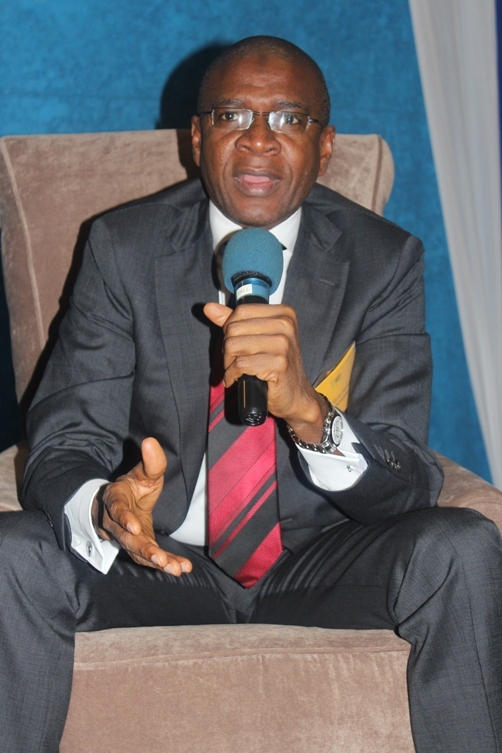 Though Bola joked about seeking out the Jamaican yams made famous for producing world class runners, for the exclusive use of Nigerian sprinters he stressed that his proposal to establish a Distance Learning platform for UTECH to access West African students, will only be successful if the price is right…that it is competitive and presents an attractive option to conventional programmes on offer at Nigerian universities. 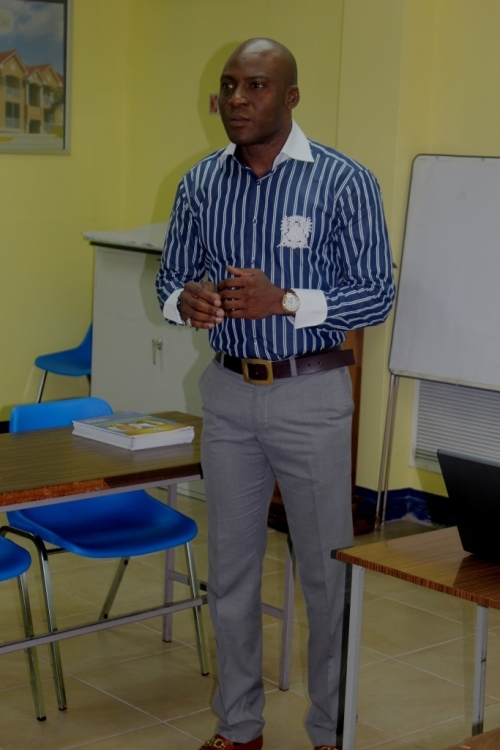 The issue of Intellectual Property was raised by School of Business official Olubusola Akinladejo who expressed concern about the security of the content and branding of UTECH on the Courteville platform. Bola and Femi swiftly responded that they have handled very sensitive systems for banks and Courteville Business Solutions owns 50% of the Mortgage Bank of Nigeria, they manage the databases insurance companies and so on and have never had a problem…Bola assured UTECH that their specialism is IT which provides a reasonable guarantee of safety. To round off this busy day the delegation were invited to attend the Eighth Regional Conference on Investments & the capital Markets hosted by the Jamaica Stock Exchange at the Jamaica Pegasus. 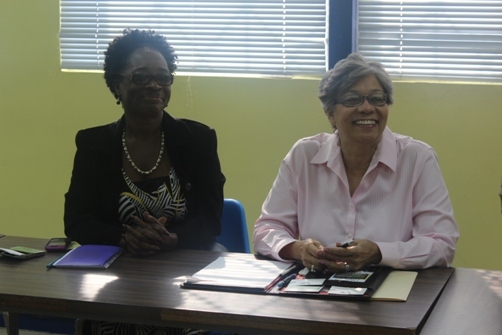 Also on hand was General Manager of the Jamaica Stock Exchange, Mrs Marlene Street Forrest who welcomed the trade delegation and congratulated coordinator Ms Claire Jackson. 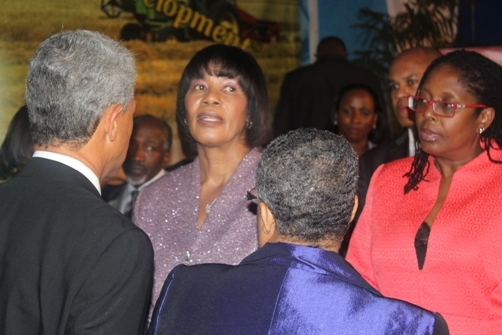 The event was graced with the presence of The Honourable Portia Simpson Miller, Prime Minister of Jamaica who was the keynote speaker. 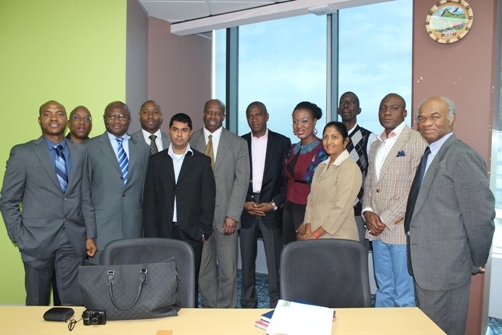 After many months of preparation and intense negotiations between CENUK (Caribbean Enterprise Network UK) in conjunction with it’s affiliate Priority Group International; and Nigerian company Courteville Business Solutions PLC the inaugural Africa Meets the Caribbean Trade Mission took off in Jamaica. CaribDirect.com was on hand to witness the excitement exuded by Priority First UK, director Denis St Bernard whose brainchild the trade mission is. He is accompanied by Clyde Baker, Director of Priority Group International and Operations Manager / Trade Mission Coordinator Claire Jackson who traveled ahead to ensure all aspects of the mission including meetings with government ministers and officials, key private sector organisations, and other special interest groups were properly coordinated. 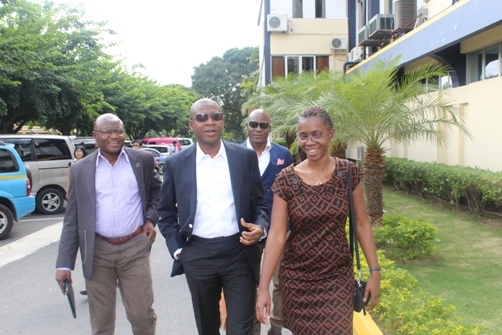 The Nigerian delegation of four was led by Group Managing Director, Mr Adebola Akindele who too was very excited about being in Jamaica for the first time and the several official meetings planned over the next four days where he will present his flagship product AutoReg. Bola, as he’s affectionately known, is accompanied by his Deputy Managing Director responsible for the AutoReg Franchise, Mr Wale Sonaike and Mr Femi Niyi, Executive Director ( Projects , Strategy and Research ). The delegation is supported by a media communications specialist Mr Oyewole Oyewo who will report on the proceedings daily. Also attending this maiden African / Caribbean trade mission are two businesses intending to establish strategic links with the Caribbean in areas specific to their respective business models. Zeraxis, an IT solutions company provides business advantages by combining their extensive business, project management and technical ability with client-chosen technologies and business process globally. Represented by half Nigerian and half Jamaican Mr Del Atah, Zeraxis are looking to recruit bright Jamaicans with a leaning toward IT, to work on two global projects. The final company attending the much talked about trade mission to Jamaica and Trinidad is Nigerian company Compass Consulting which forges ties between Nigerian businesses and foreign investors/partners, creating platforms for Business to Business engagement and Networking. 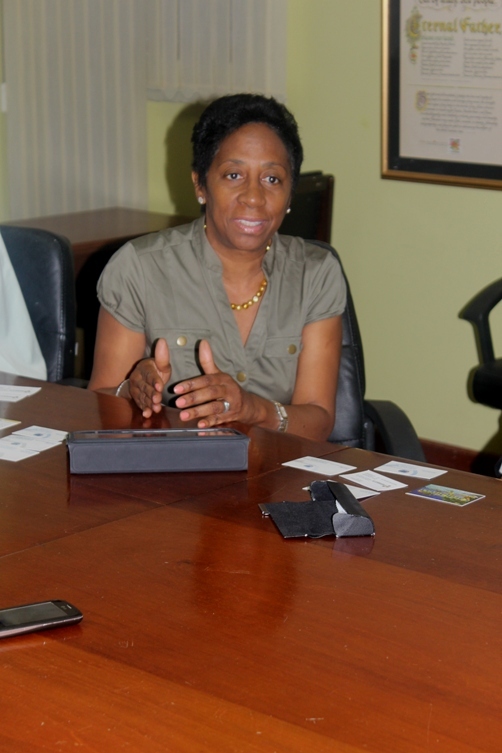 In conversation with CaribDirect at the Jamaica Pegasus today, Monday 21st January, CEO Mrs Tokunbo Olamiju Ajilore- Chiedu spoke of her keen interest to establish strong links with enterprising Jamaican and Trinidadian businessmen and women. 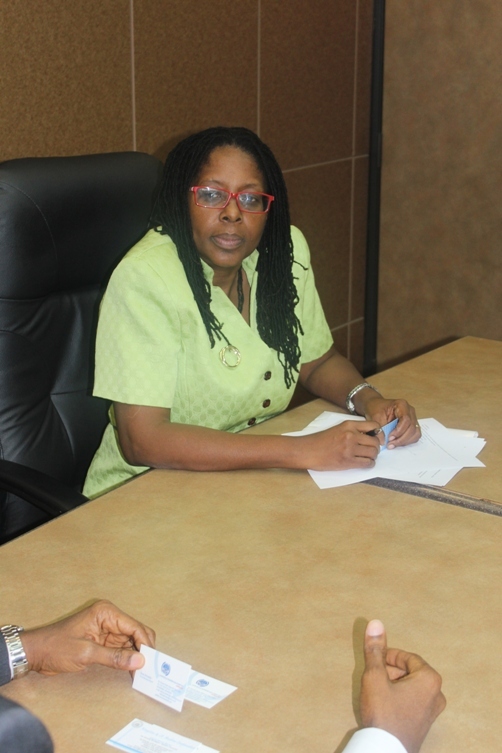 The first meeting of the day was with Jamaica Promotions Corporation (JAMPRO) at their offices in Kingston 10. 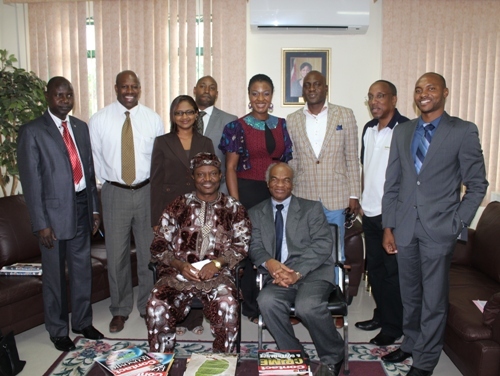 The mission delegates were received by the Vice President Investment Promotion Mr Claude Duncan. Following the introduction of a few key staffers including Manager, Knowledge Services, Mr Vivion Scully, Senior Consulting Officer, Knowledge Services, Michele Marius and Manager Creative Industries, Kim Marie Spence, Mr Denis St Bernard encouraged all to introduce themselves. Before long Mr Duncan launched into a comprehensive and enlightening presentation on the remit of JAMPRO which is basically to facilitate trade and investment into Jamaica. 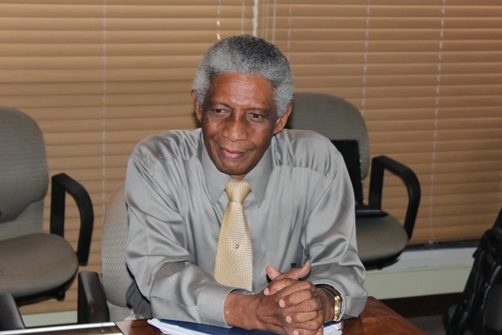 Among many items Mr Duncan spoke of the political stability of Jamaica which presents an ideal environment for investment; the importance of the three international airports; Norman Manley International Airport, Sangster International Airport and Boscobel International Airport caters to private jets; the potential and world rating of the Port of Kingston which is one of nine active ports and is the 7th largest port in the world; the road infrastructure which is under development and has proudly rendered Highway 2000 and the project to link North Coast Highway and the South Coast Highway together; and the telecommunications prowess of Jamaica owed to two main network suppliers LIME and Flow. 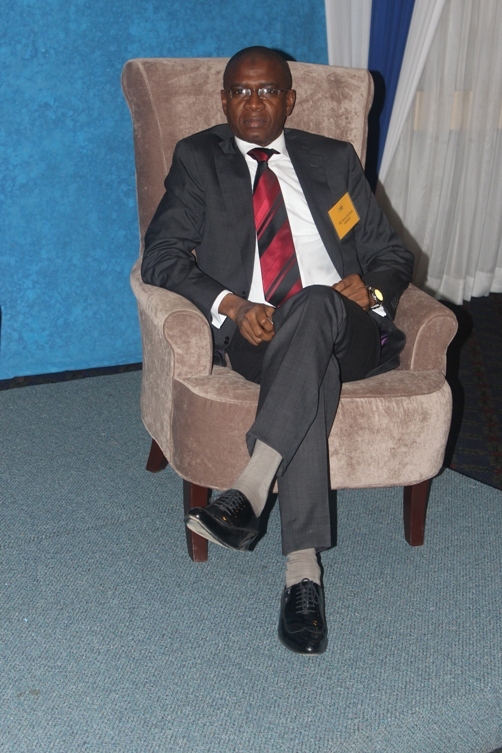 He further made the point that there is no discernible reason why Nigeria and the Caribbean could not trade effectively given our genetic and cultural similarities stressing the point that his company Courteville Business Solutions successfully rolled out their AutoReg product in the city of Lagos which is the size of Jamaica but with a population of over 20 million. His argument here is that if it could work in such a densely populated and intrinsically complicated market, it can work in the Caribbean. 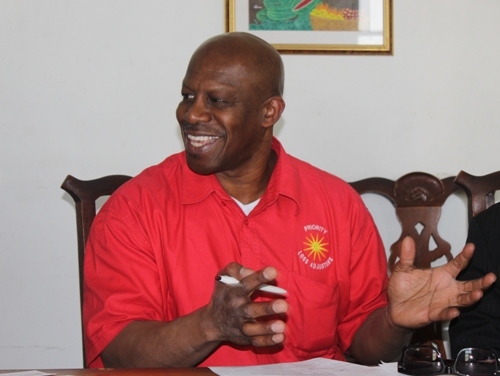 Bola also made the observation that we in African and the Caribbean do not have to follow the ideals of the Western world to build our economies and businesses, that we are clever enough and resourceful enough to chart our own course to success. 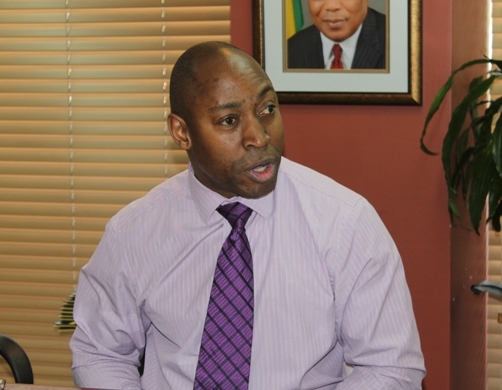 Bola pledged his intent to invest in Jamaica without receiving a penny from the government of Jamaica in advance with the view to being paid when the project takes off. 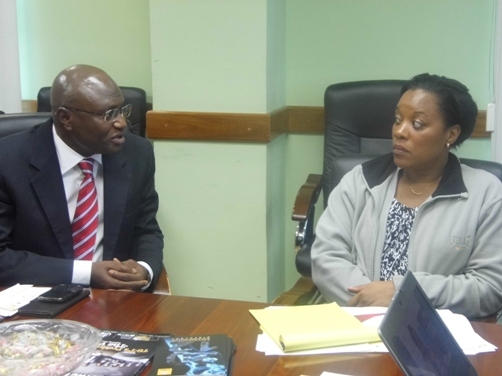 He extended a firm and sincere invitation for JAMPRO to visit Nigeria at the earliest opportunity to take advantage of educational (Online Distance Learning) and trade opportunities. The mission then moved quickly over to the Nigeria High Commission where they were met by the Deputy High Commissioner and two officers Umar Z. Salisu Minister/ Head of Chancery and Martin Obafemi Olutola, Minister. 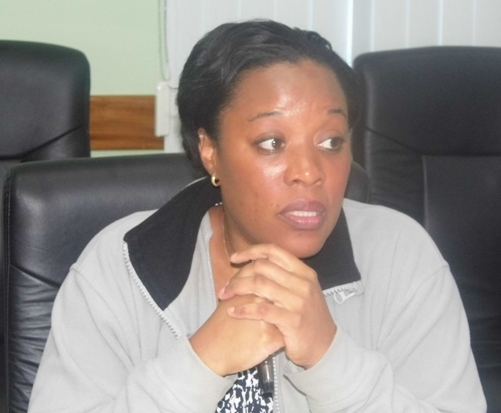 The Deputy made the distinction about the work ethic and pace at which things are done in both Nigeria and Jamaica, highlighting the point that in Nigeria things are done quickly and that the trade delegation should manage their expectations in terms of realising tangible results from this mission. 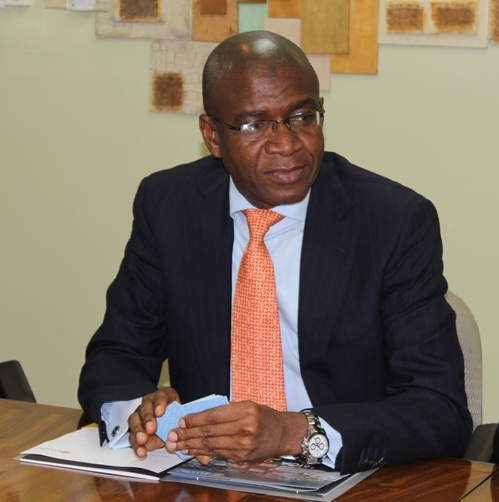 He applauded Bola and his team for as he put it, ‘Making the work of the Nigeria High Commission much easier.’ He also committed the Nigeria High Commission to support and work with the trade mission and took time to schedule further meetings with certain participants for later in the day. 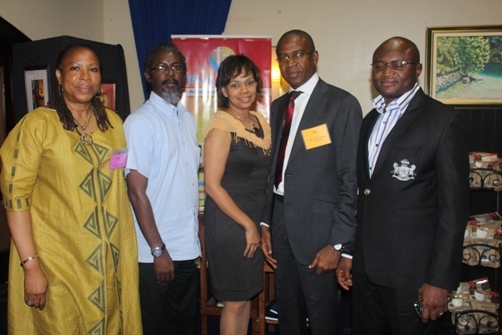 Stay with us for daily reports on this Africa meets the Caribbean trade mission. 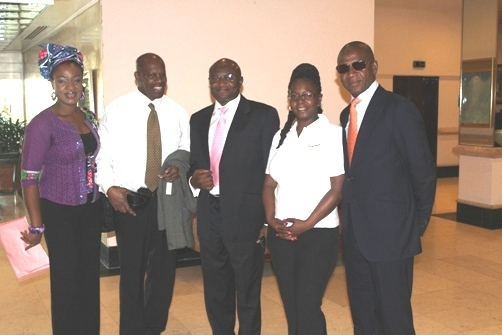 Priority Group International through its United Kingdom affiliate and Social enterprise, Caribbean Enterprise Network (CENUK) have embarked on a trade mission to Jamaica and Trinidad & Tobago from January 20th to 29th 2013. Comprising 2 Nigerian companies and four British companies this mission is endorsed by Jamaica Promotions Corporation (JAMPRO) and Trinidad & Tobago’s (InvesTT). Courteville a leading African software solution Company, based in Lagos Nigeria is listed on the Nigerian Stock Exchange and ISO 9001:2008 certified with its principal focus being the development of e-business solutions for process re-engineering in all sectors. Courteville is the patent holder of the AutoRegTM Motor Vehicle Administration Documentation (AutoRegTM MVAD) business solution, through which it created the largest data capture and process platform in sub-Sahara Africa. The company has honed its expertise and knowledge in the development of IT solutions that effectively solve endemic and peculiar challenges such as counterfeiting, forgery, revenue leakages, touting, unreliable databases, delivery time, etc. These solutions, which are all web-based and extremely cost effective to deploy, include the flagship and highly successful AutoRegTM MVAD, AutoInsure (3rd Party motor insurance retail platform), AutoReg InspectorTM (mobile phone based remote verification application), AutoRegTM Enumerator (mobile phone based remote data capture application), Parent-School Education Administration & Management Solution (P-SEAMS), Courteville Regulated Product Administration & Monitoring Solution and the Central Insurance Policies Database Solution. Compass Consulting is a company forging ties between Nigerian businesses and foreign investors/partners, creating platforms for Business to Business engagement and Networking. Compass works with the Bank of Industry, the National Association of Small Scale Industrialists and a host of other partners to develop the capacities of SMEs to export through annual workshops and business diagnostic sessions. They aid in capacity building of SMEs in Agro Allied processing and packaging and organises, trade missions for UK Diaspora businesses to Nigeria, missions for Nigerian businesses to Gambia and access EU Funds for market entry visits/overseas market intelligence. Caribbean Enterprise Network (CENUK) a social enterprise focused on helping Caribbean businesses in the Caribbean and the UK to increase their competitiveness and export capability. We have special responsibilities to facilitate the newly formed Professional Working Group for CARICOM (Caribbean Common Market) Diaspora Initiatives. PRIORITY FIRST UK LTD, part of the Priority Group of Companies, a Business Support Service based in London and Jamaica with representatives throughout the English Speaking Caribbean. This consultancy focuses on Investigation, Background Checks, and Business Facilitation Services from assisting start ups and established Businesses to creating and assisting various Caribbean / UK/EU Trade Missions. Since 1989, the Zeraxis team have provided business advantage by combining their extensive business, project management and technical ability with client-chosen technologies and business process globally. The resulting engagements not only support the client’s core business, but are delivered on time and on budget. People, Process, Technology is a Zeraxis mantra. Each element presents significant challenges, but it is the ability to integrate all three that will deliver real benefit to your business. If you have a people, process, or technology problem, but lack the skill, time or independent perspective necessary to solve it we can advise. All successful solutions require evaluation of People, Process and Technology and well-defined business processes that successfully integrate them will yield consistent and positive results. CaribDirect.com is an online media house which gathers news and information from the Caribbean region for dissemination to the Caribbean Diaspora and vice versa. With only original articles provided by a raft of writers from around the Caribbean, the USA and Britain, ranging from the amateur to the professional and boasting a total of 350,000 readers to date from over 170 countries around the world. 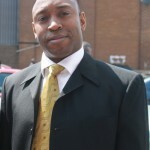 CaribDirect.com is fast becoming the most sought after portal for Caribbean Diaspora news and the fastest growing Caribbean business and lifestyle website on the internet.